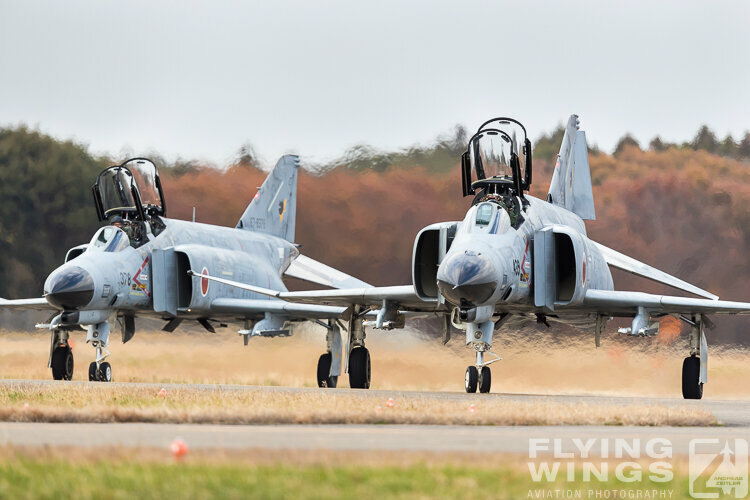 Ten (R)F-4EJ Phantoms lined up in front of the crowd was a sight to behold! 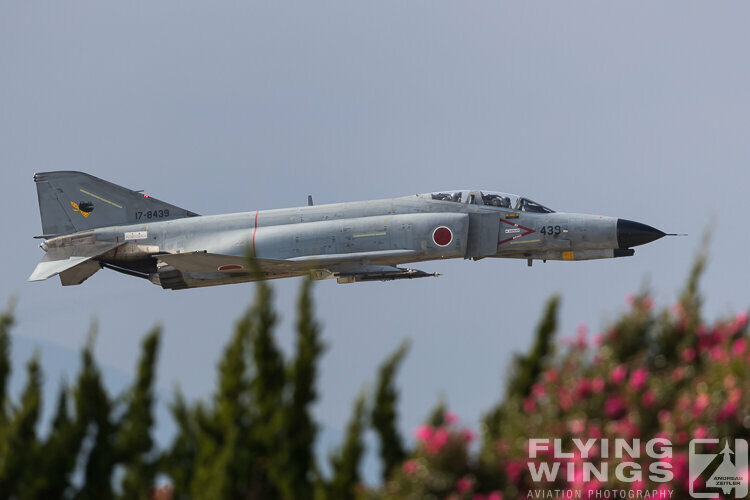 The Hyakuri Airshow 2018 was the last ever opportunity to see such a large number of mighty Phantoms in action as JASDF Phantom operations will dwindle down rapidly in the coming years. 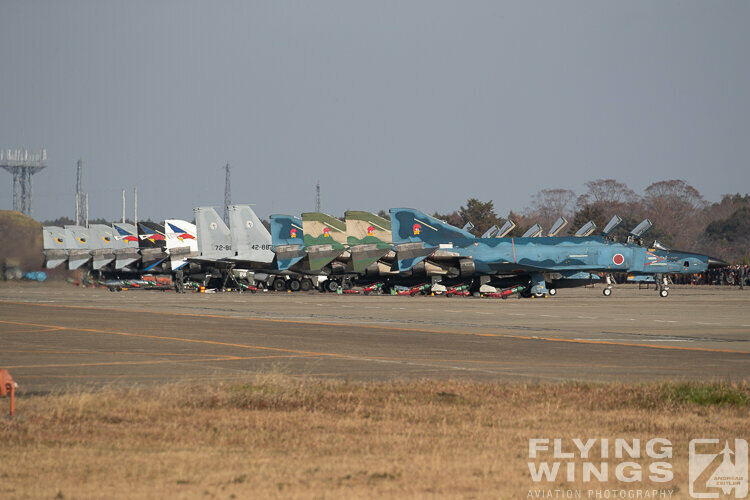 The row of Phantoms was impressive. 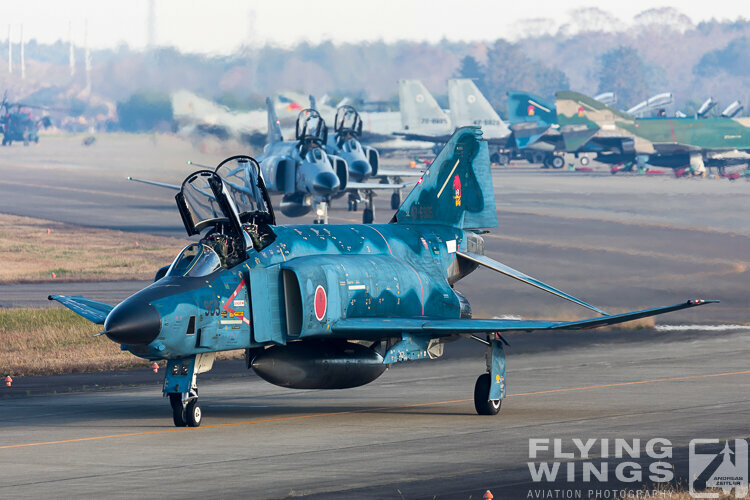 Ten Phantoms stood ready for the flying display at the Hyakuri airshow 2018. 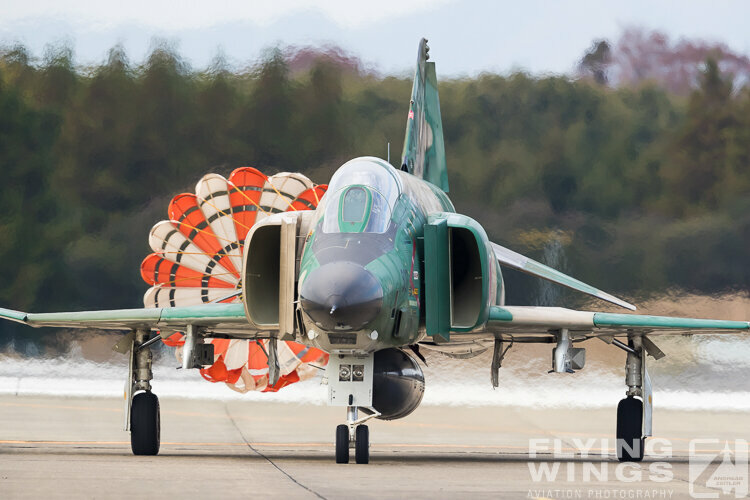 Apart from the air interceptor variant F-4EJ the green/brown and blue sea camouflage colored RF-4EJ recce Phantoms were in line in the very early morning hours even already before sunrise. 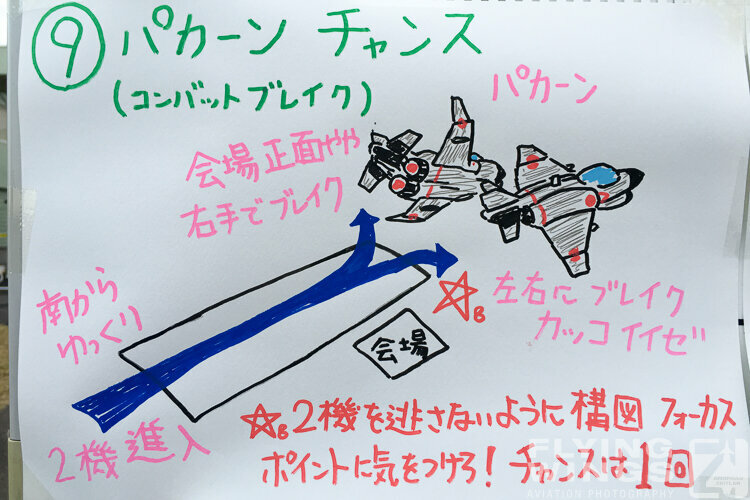 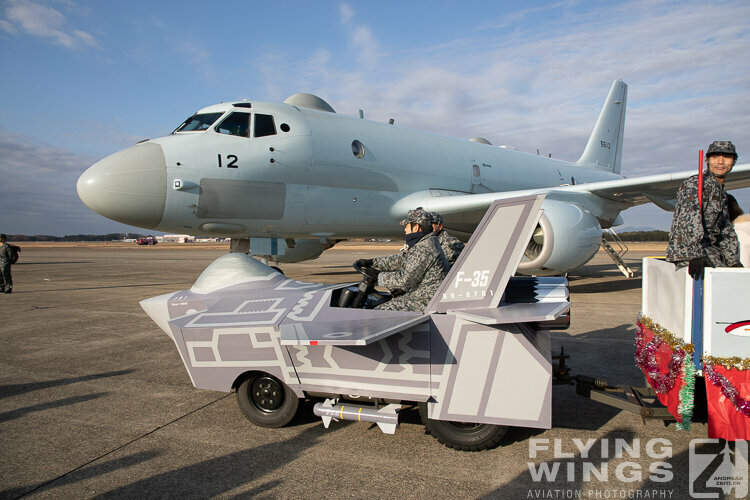 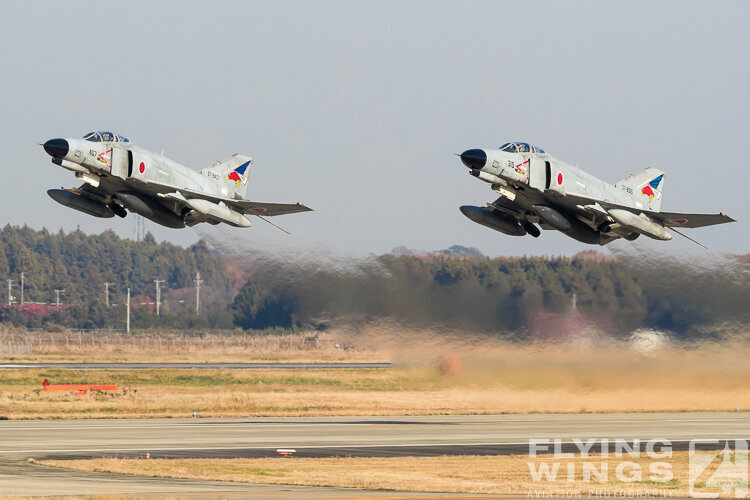 But the numbers of flying Phantoms will go down fast in Japan. 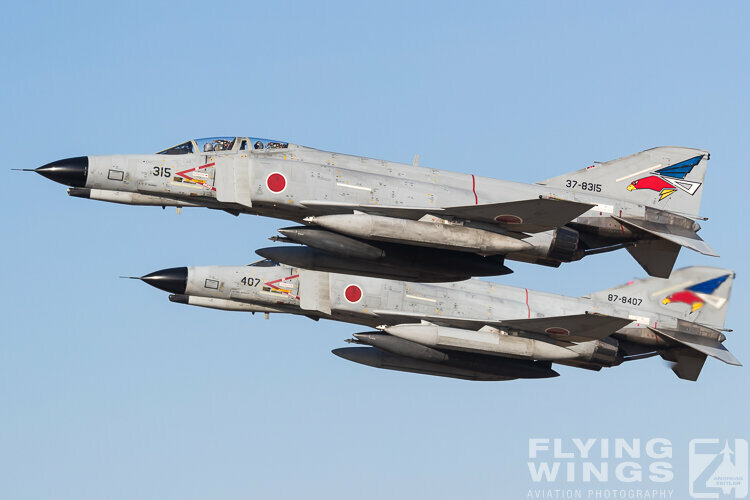 The Land of the rising Sun introduced the Phantom into service in 1971 and was once a main operator of the mighty McDonnell Douglas F-4 Phantom II. 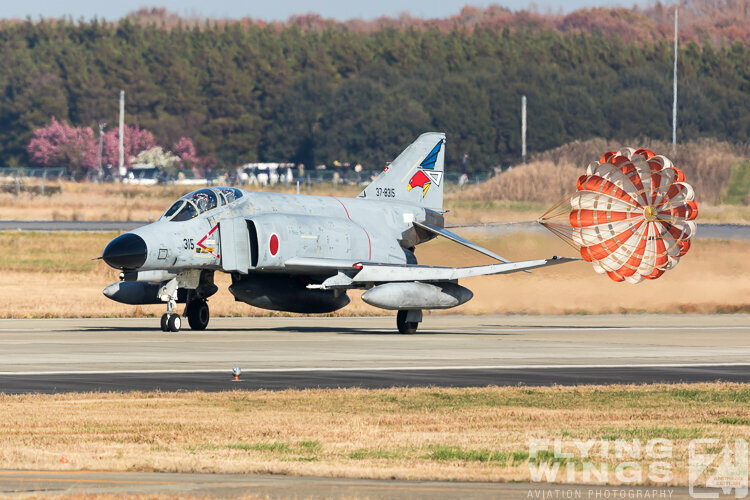 Seven Squadrons of Phantoms did fly from main airbases up in Northern Chitose down to Naha on Okinawa and protected the Japanese airspace. 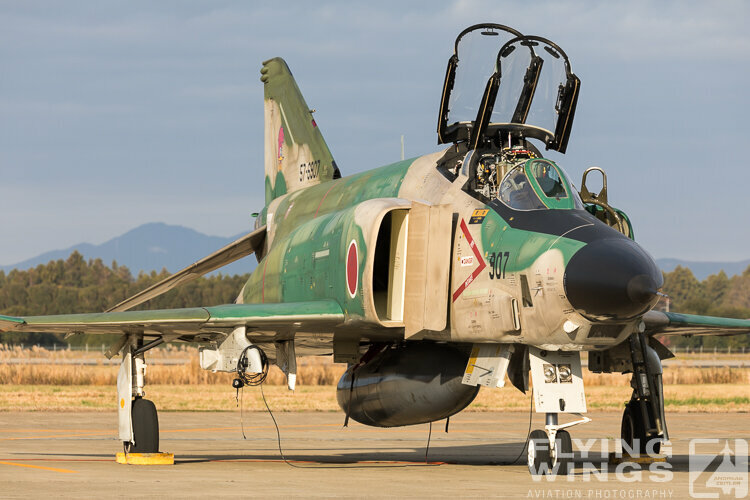 154 airframes were in service, 96 out of them were upgraded to the F-4EJ Kai standard at the end of the 1980s. 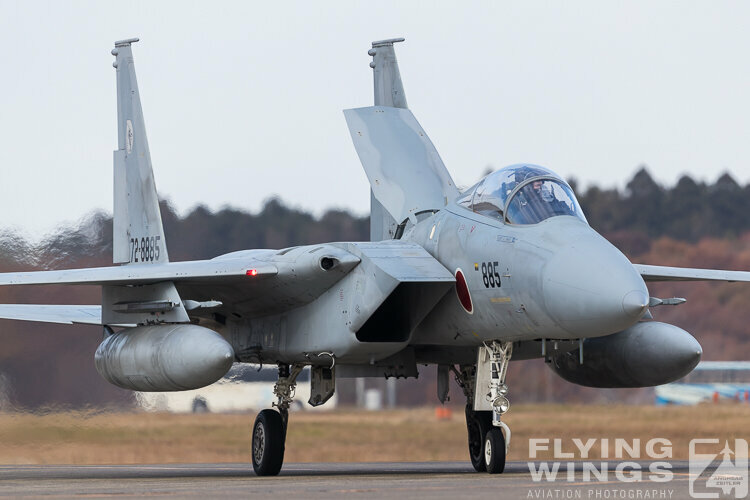 Nowadays their main task of air superiority has been overtaken by the more modern F-15J Eagle that can also carry more modern air-air missiles such as the AAM-4 or AAM-5. 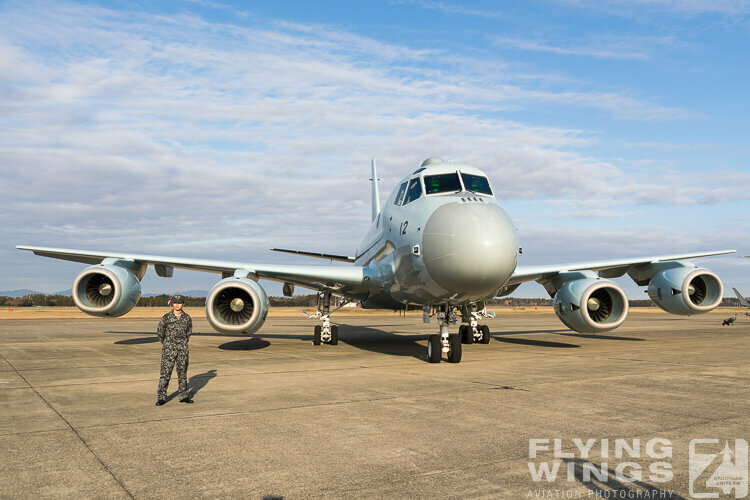 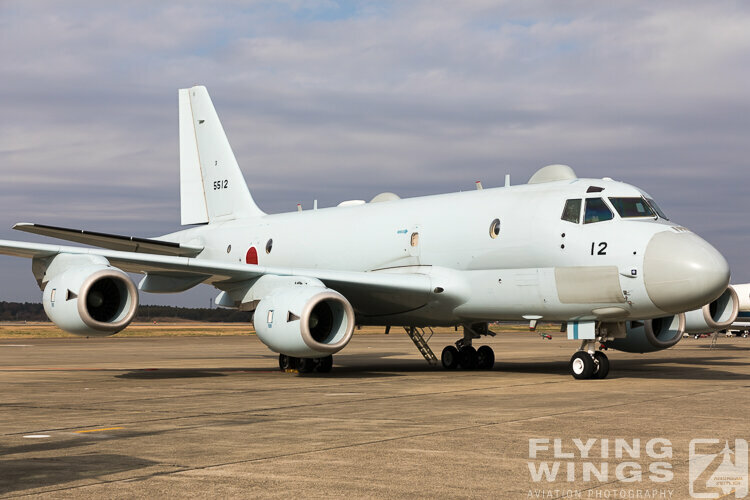 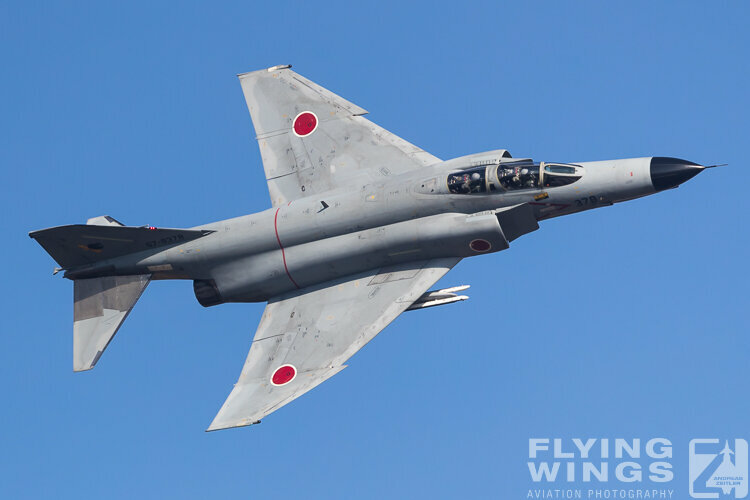 It is up to them to regularly go hunting for Russian and Chinese military jets that operate in the vicinity of Japan’s airspace. 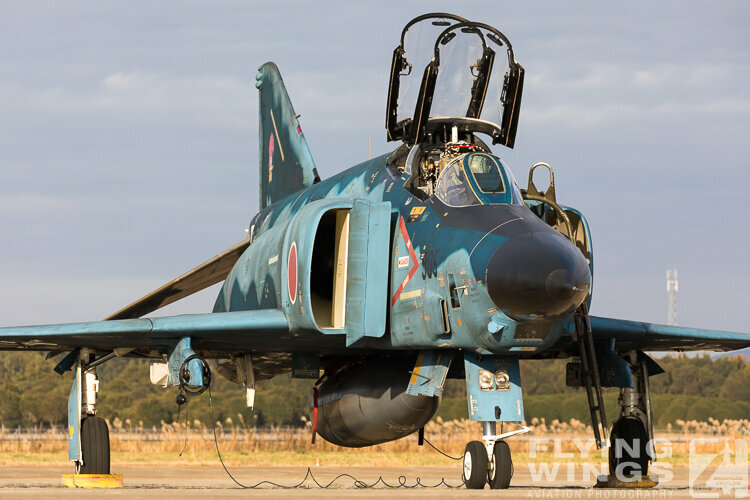 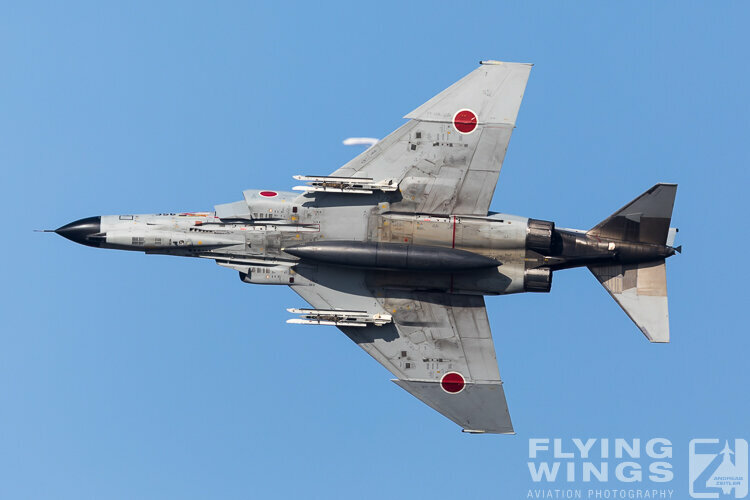 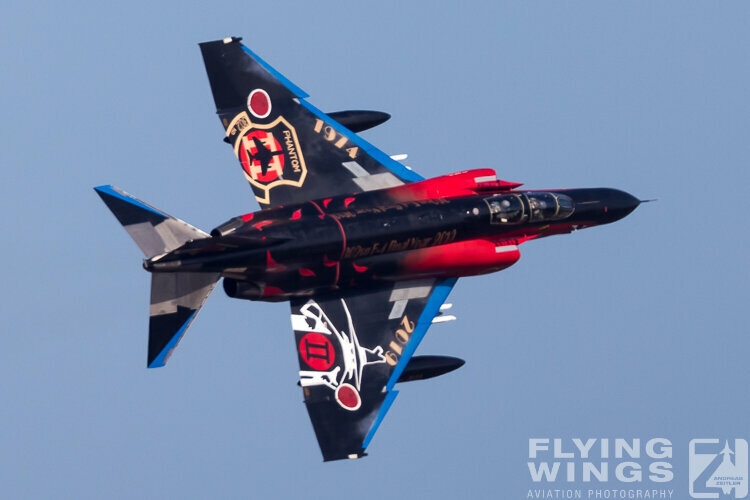 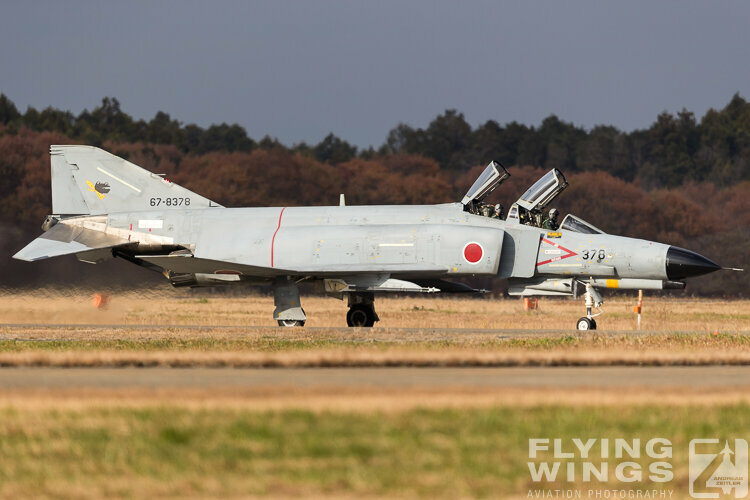 Despite reduced in numbers, Japan is still a main operator of the Phantom II, but its days in the JASDF are clearly counted. 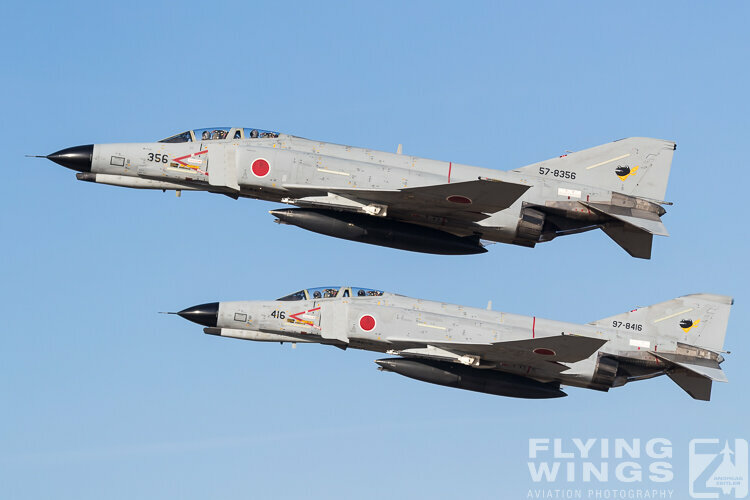 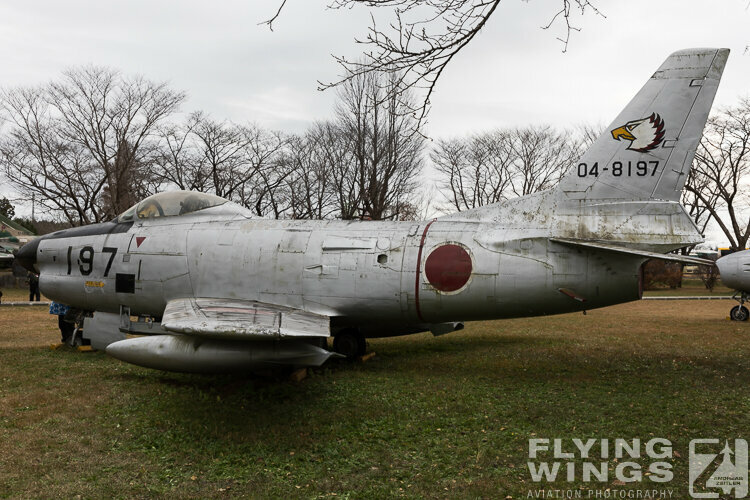 All of the three remaining Phantom Squadrons of the JASDF are based at Hyakuri for the end of their career. 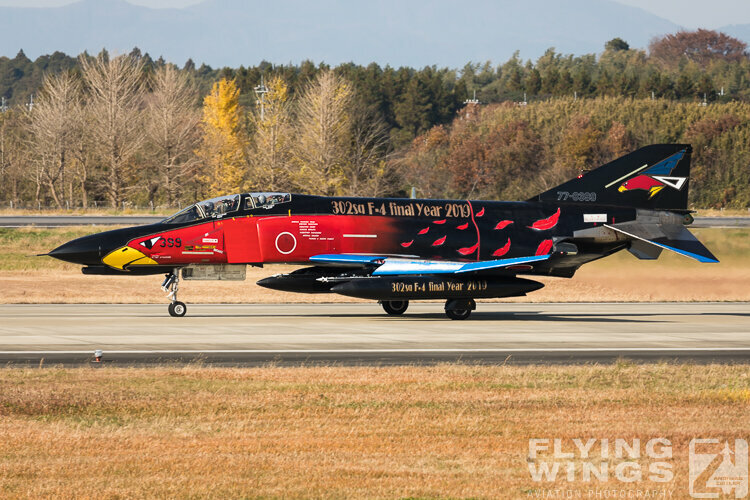 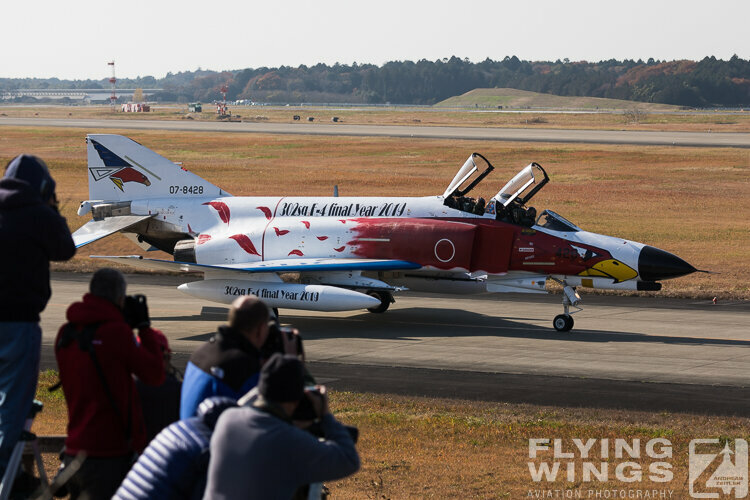 The airshow in 2018 was the farewell to the Phantoms of 302 Hikotai (Squadron). 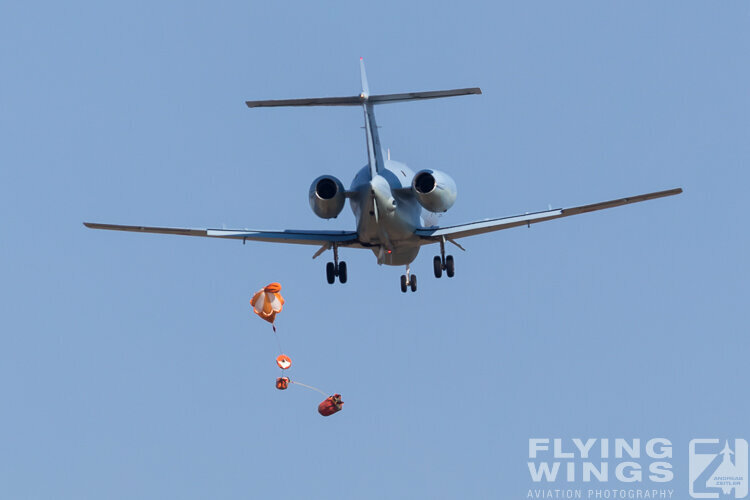 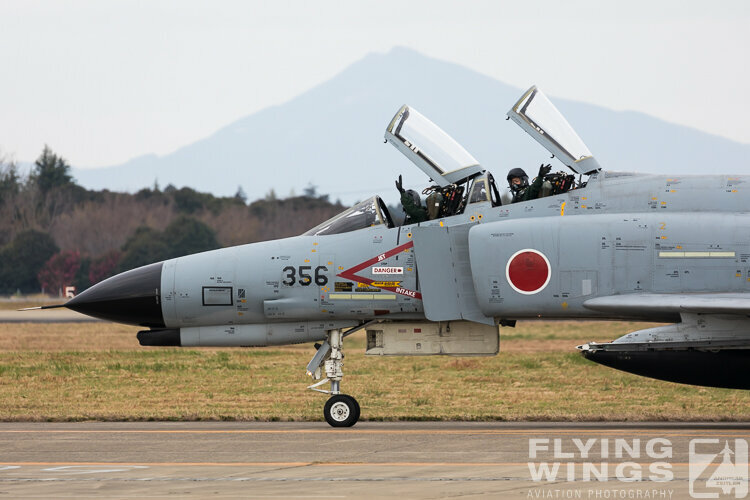 The Squadron formally disbanded at the end of March 2019, though their flying activity already ended at the beginning of that month. 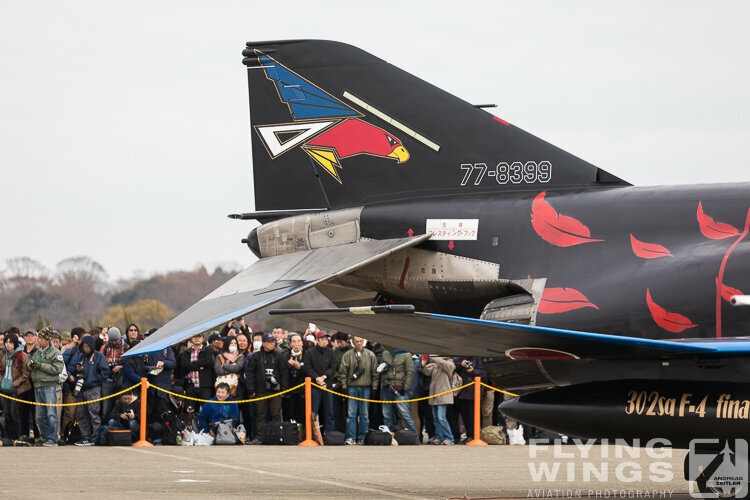 The jet specially painted in white to mark that occasion was already presented in autumn 2018 to bid farewell to 302 Squadron Phantom operations. 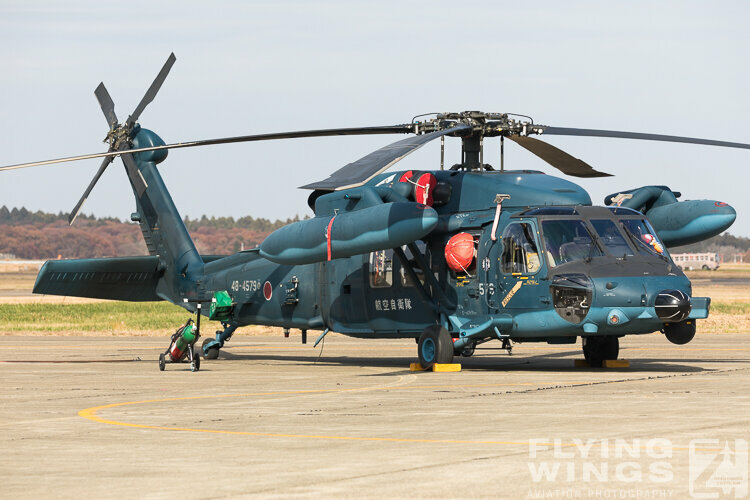 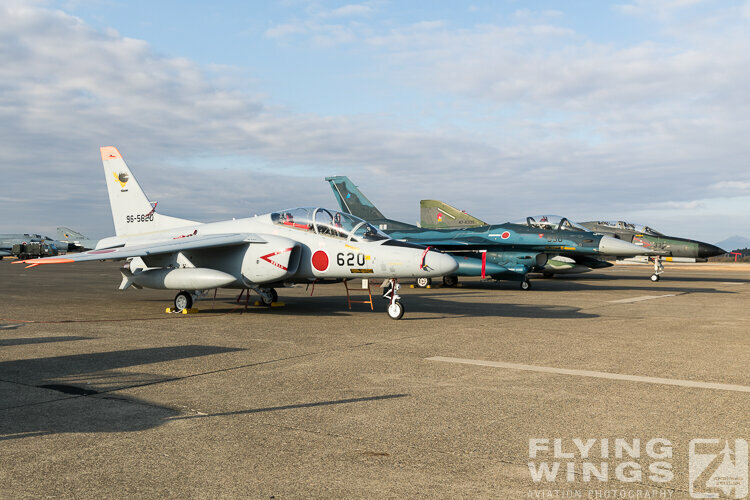 In Japan’s autumn airshow season it did visit all of the former 302 airbases, amongst them Komatsu, Nyutabaru or Naha. 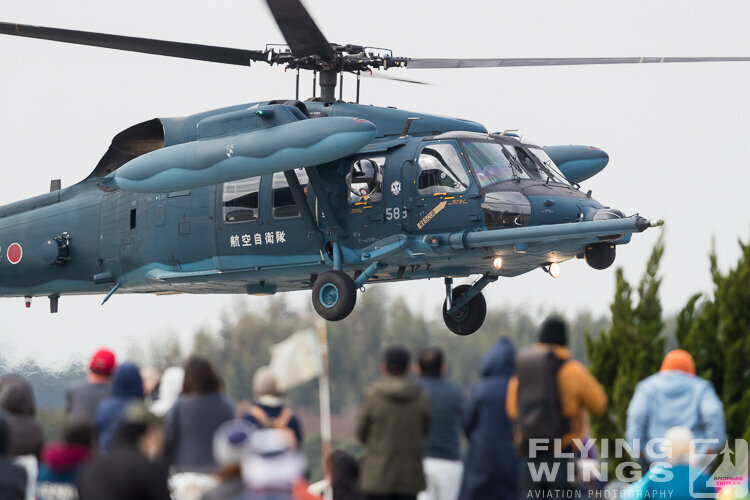 Its black counterpart was only presented days before the airshow. 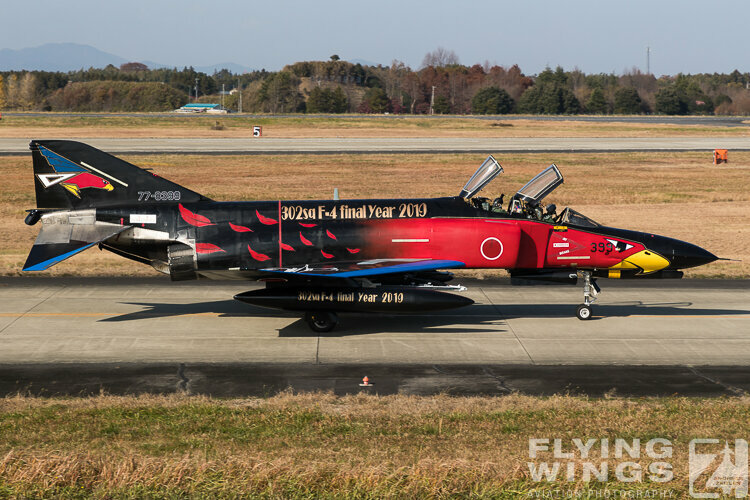 Put in a more appropriate black dress it was the white Phantom’s twin as it wore the same markings around the fuselage. 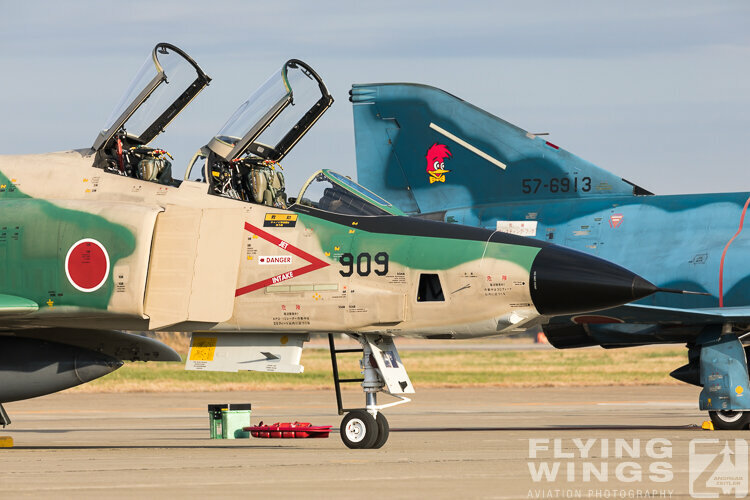 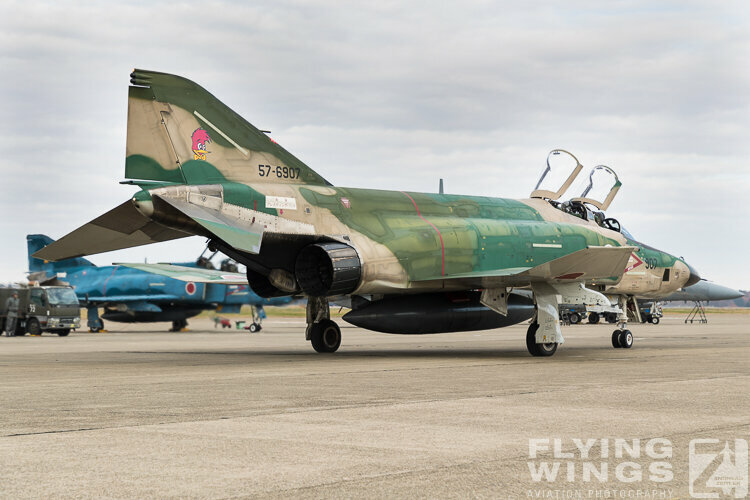 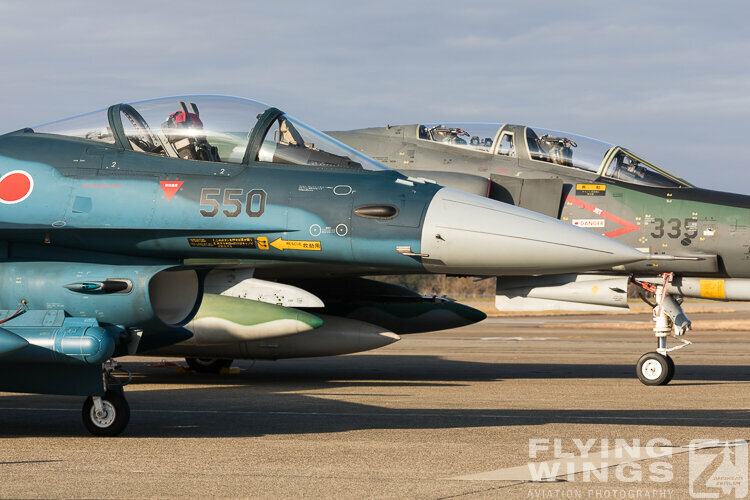 Fittingly the jets wore large “302sq F-4 final Year 2019” markings on their fuselage. 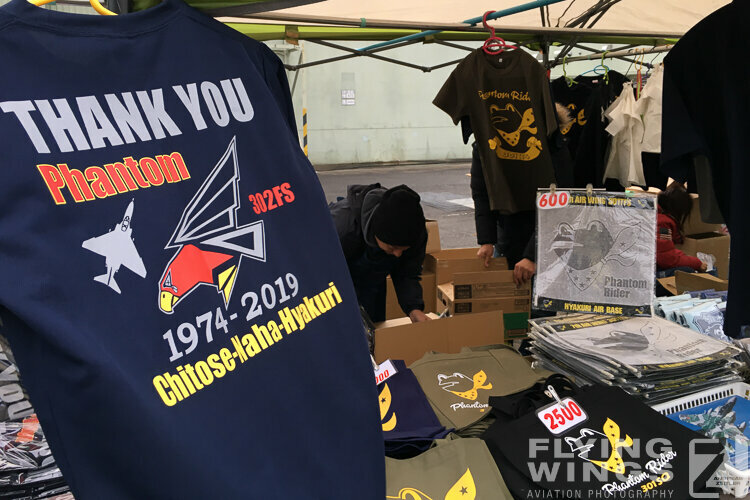 It was the last ever airshow of 302 Hikotai Phantoms as the Squadron will move to Misawa and subsequently transform to the Lockheed-Martin F-35A Lightning II. 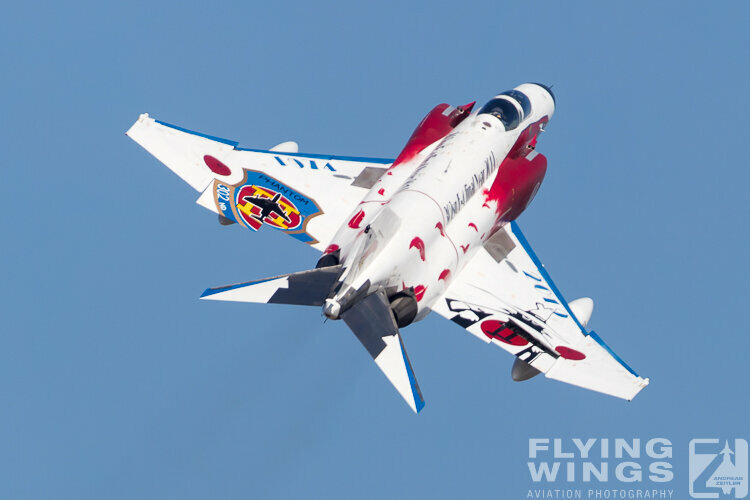 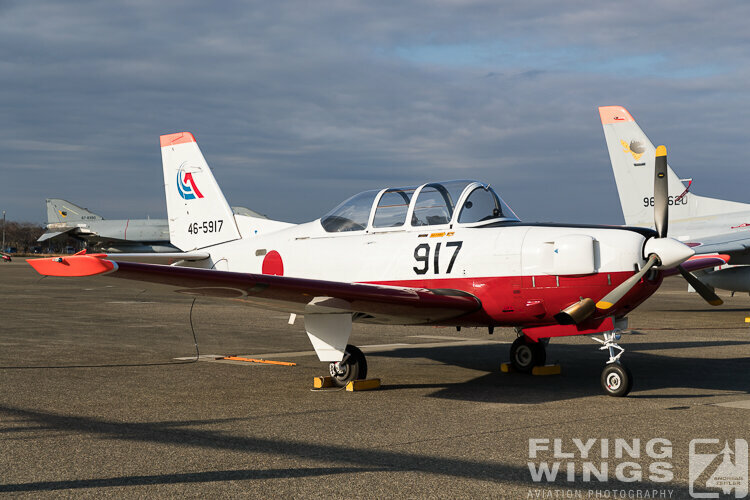 Gone will then also be the days of Japan’s Air Self Defence Forces most colorful tail-marking, the blue-white-red colored “Ojiro”. 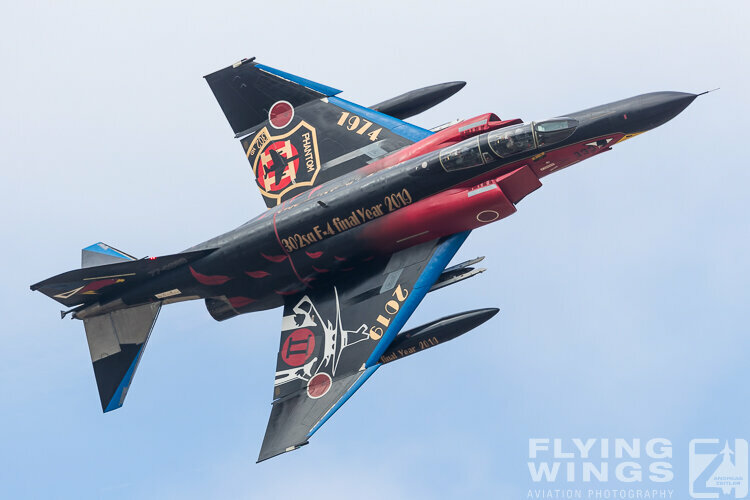 The Sea Eagle with a stern expression on his face represents the 302 Squadron number with the 3 wing feathers, an 0-shaped tail and 2 yellow claws. 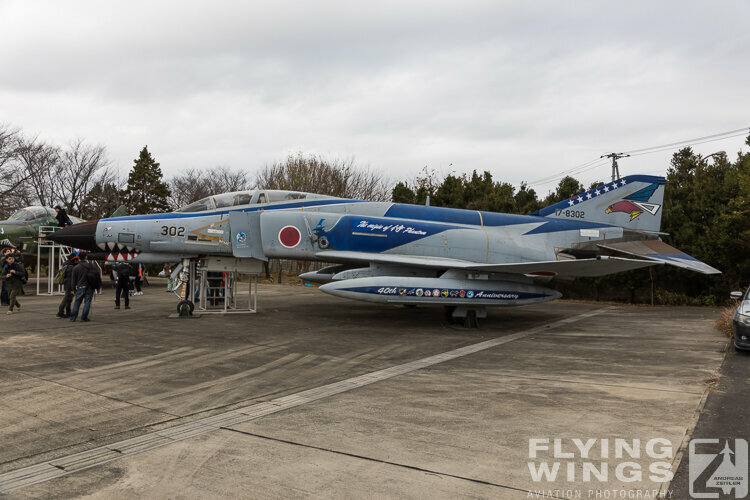 The two remaining Phantom Squadrons are 301 Hikotai, the “Phantom Mother“ Squadron, and 501 Hikotai, Japan’s sole purely Reconnaissance Squadron. 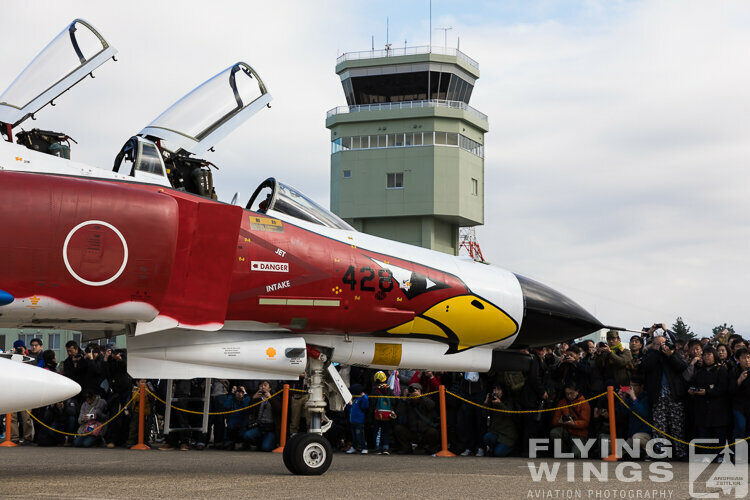 However 501 Squadron will disband at the end of fiscal year 2019, which is March 2020. 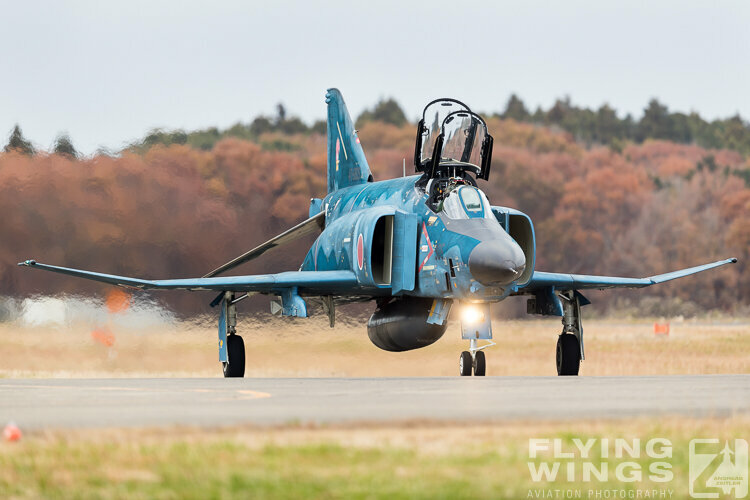 So the next airshow in 2019 will be the last chance to see those rare and attractive birds. 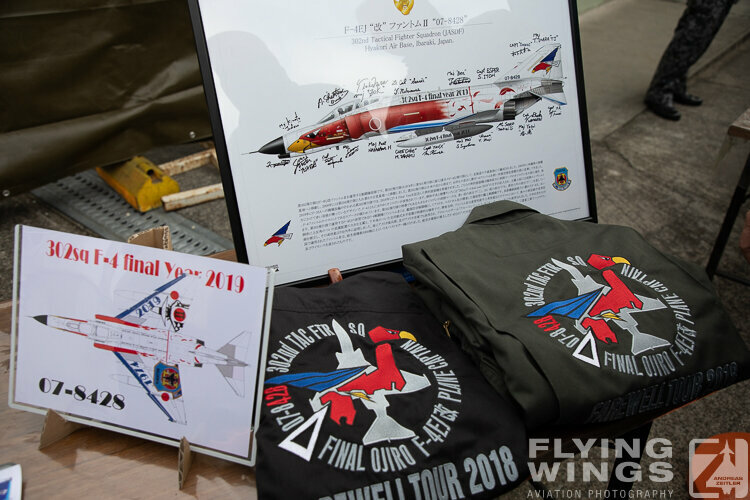 After that 301 Squadron will follow only one year later. 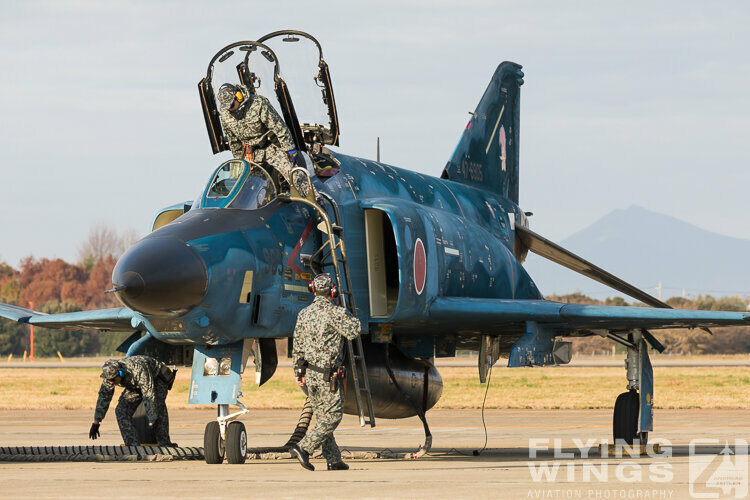 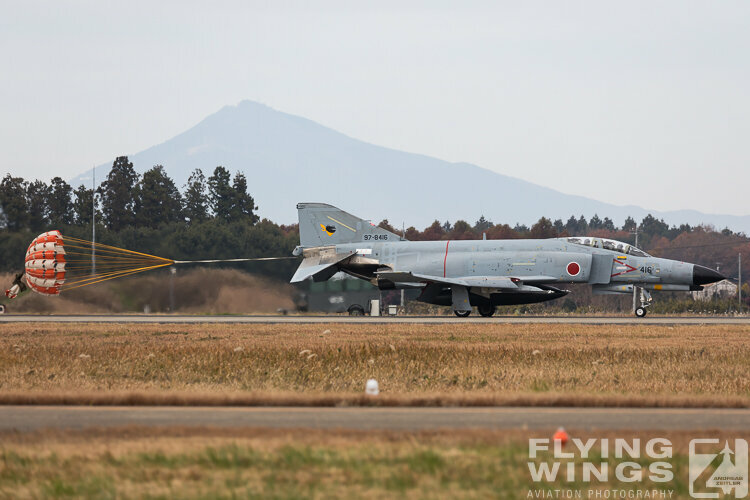 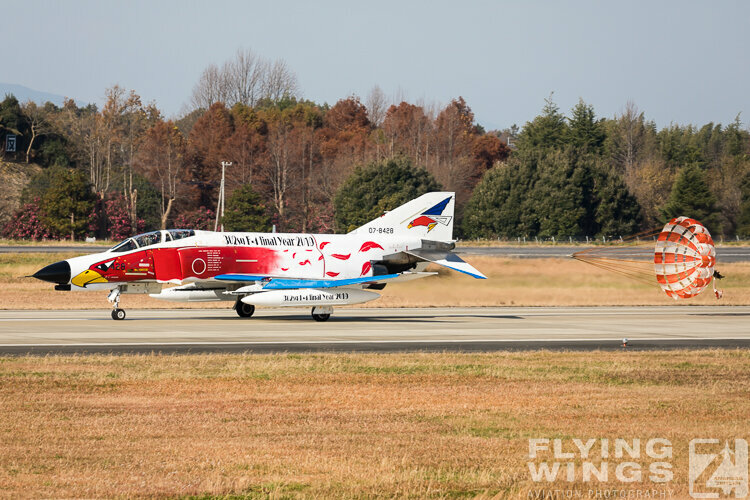 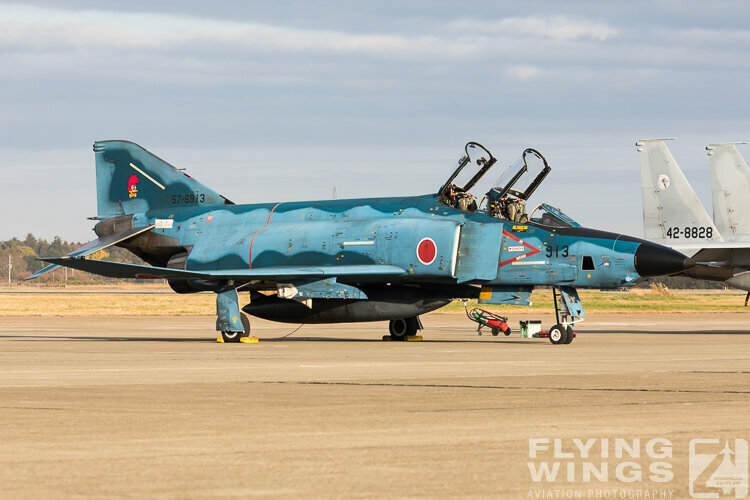 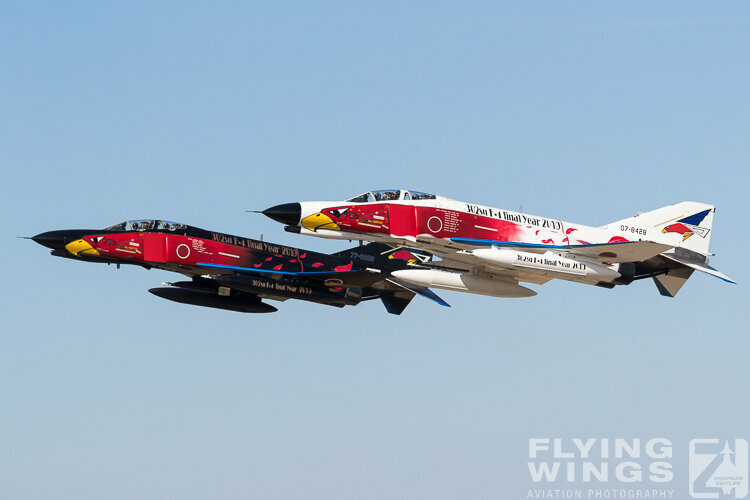 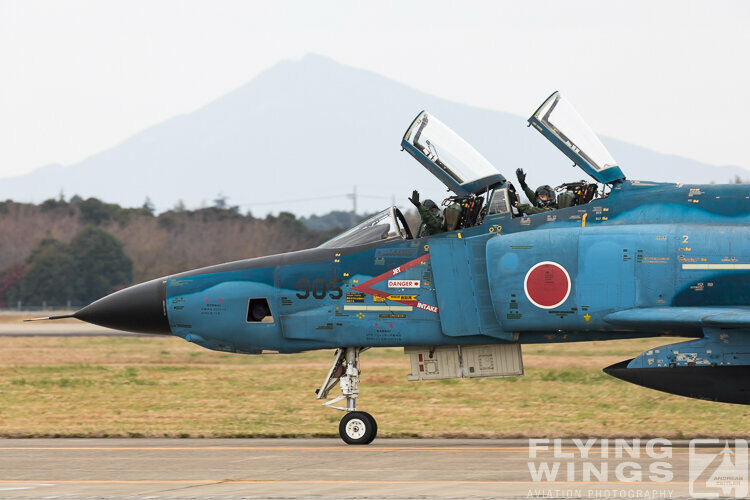 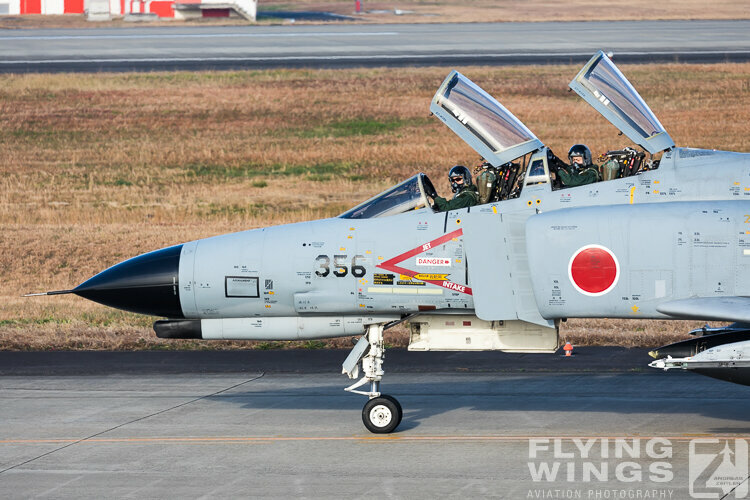 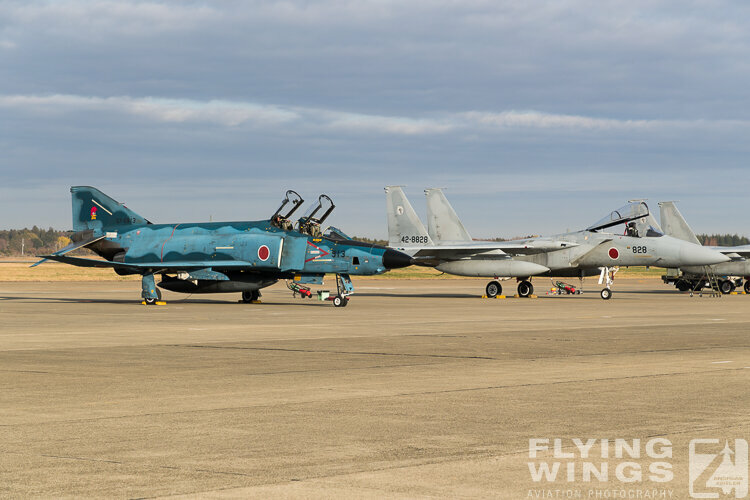 It will be a “First in, last out” for 301 Hikotais as it was the JASDF first Phantom Squadron. 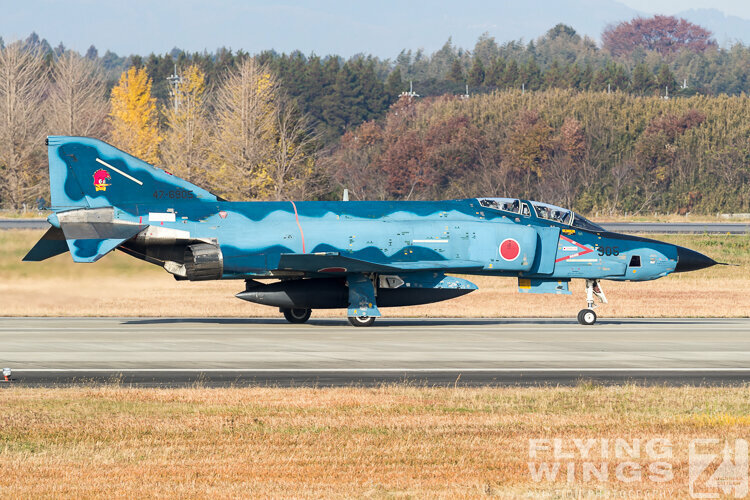 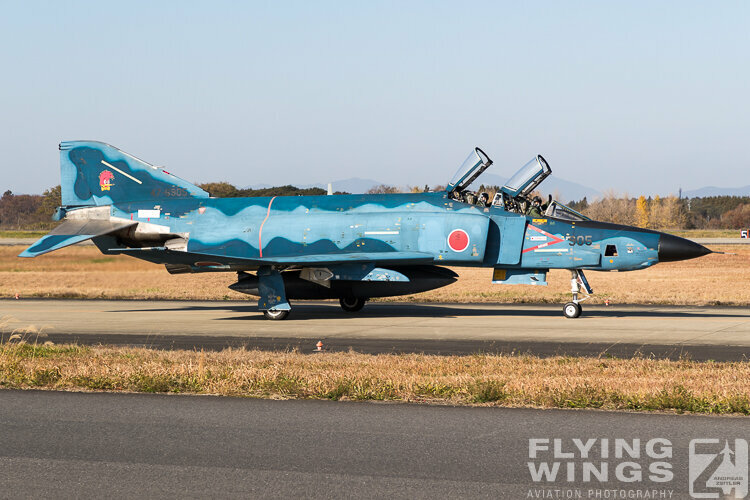 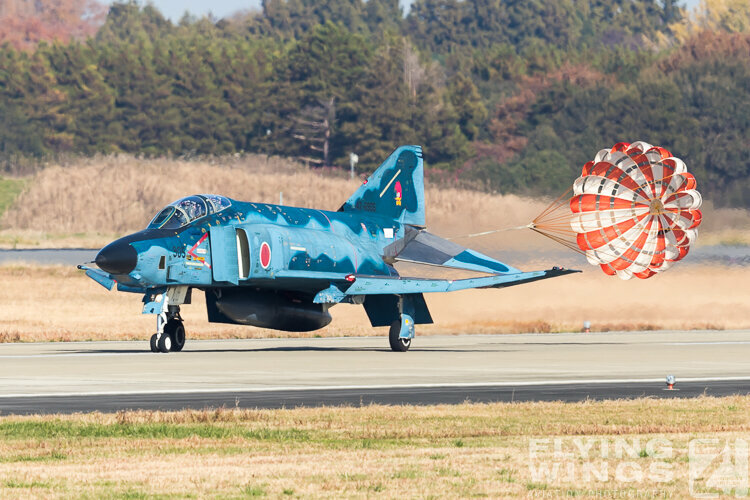 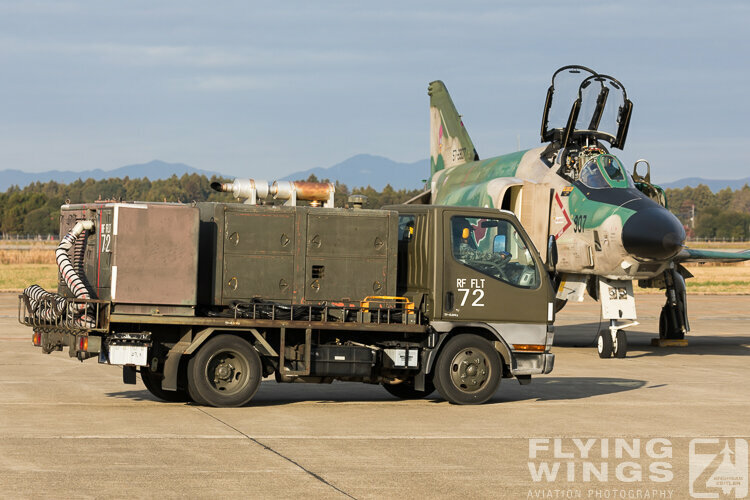 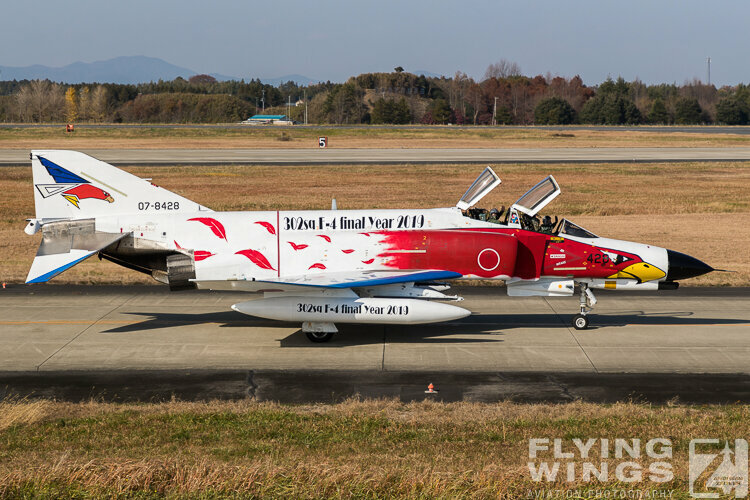 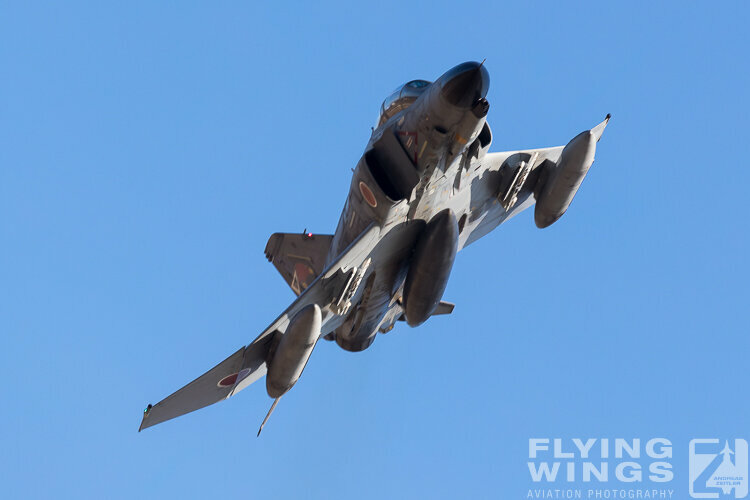 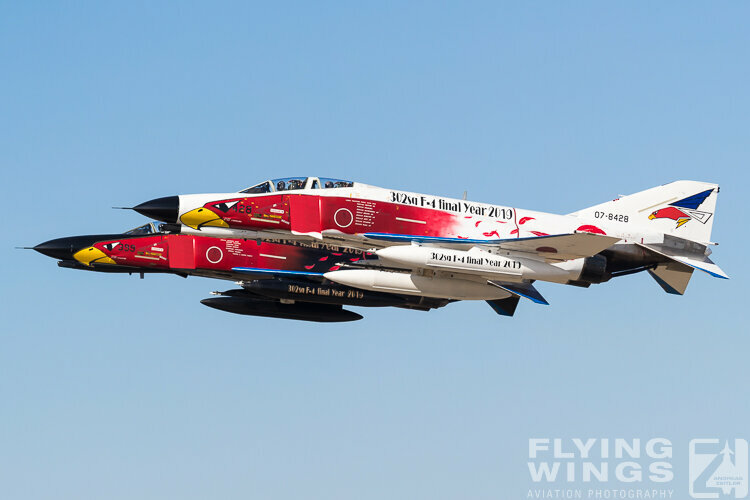 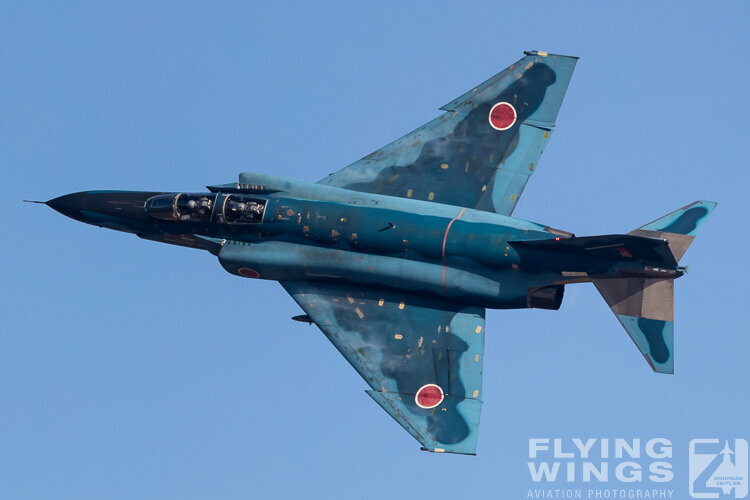 And this will also go along with the disbandment of the remaining few F-4EJ (Kai) Phantoms at the Flight Test Centre Gifu. 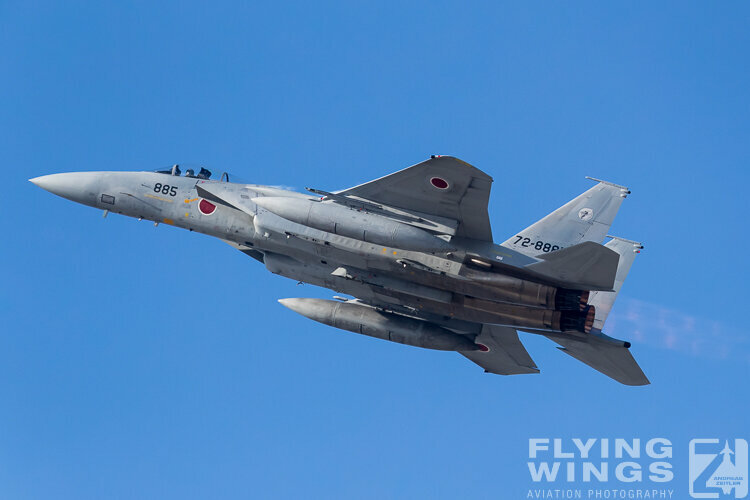 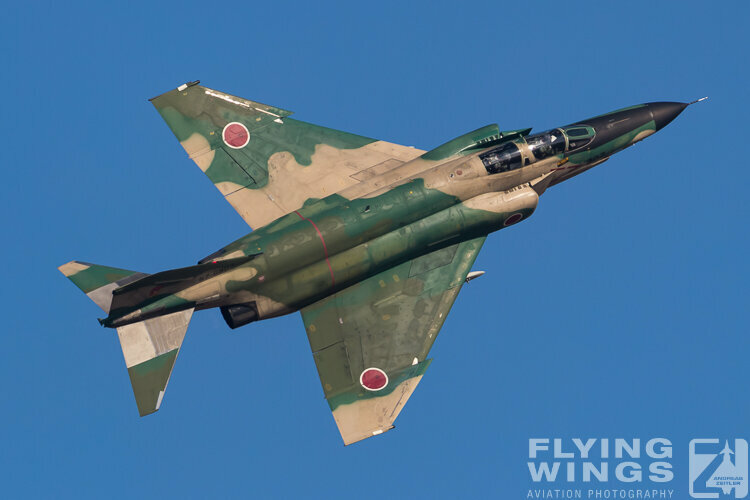 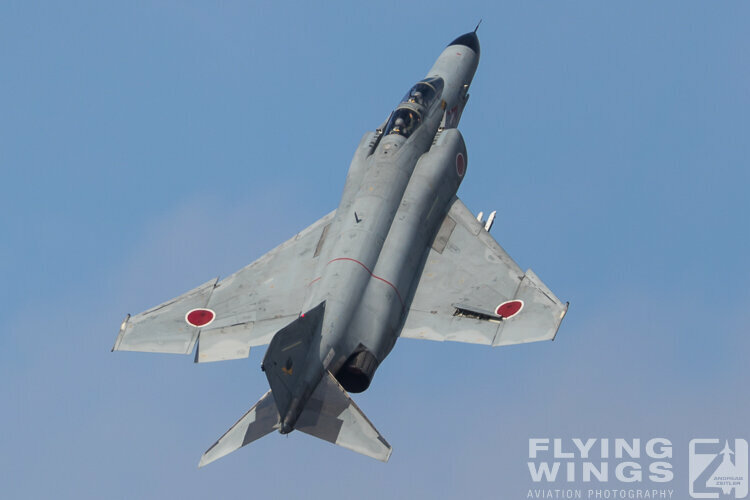 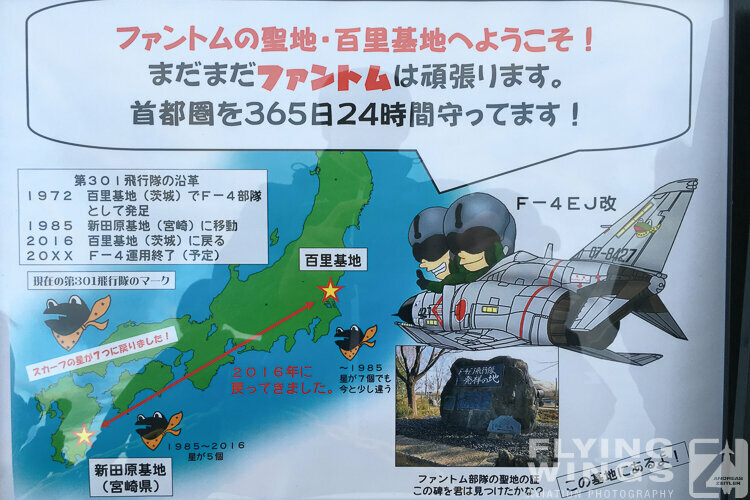 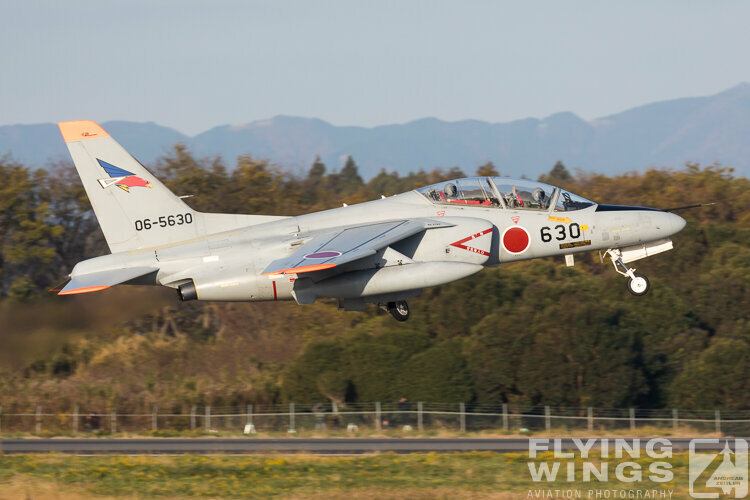 It will be in early 2021 and coincide the JASDF Phantom 50th anniversary. 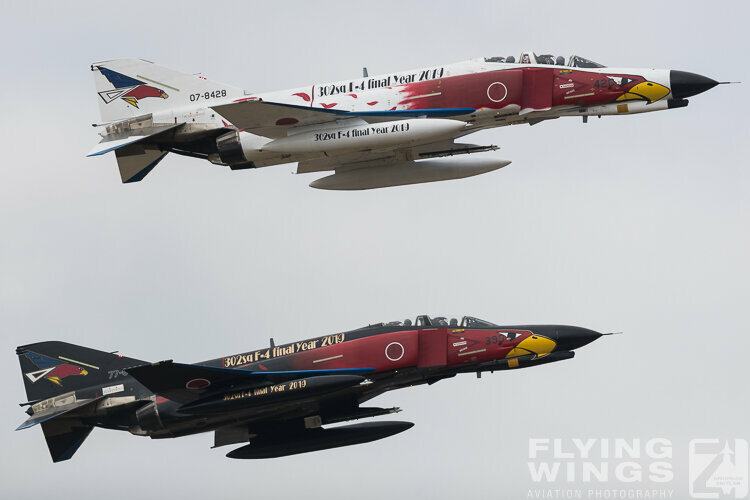 As usual for airshows in Japan the flying program was rather short and mostly performed by the local Squadrons. 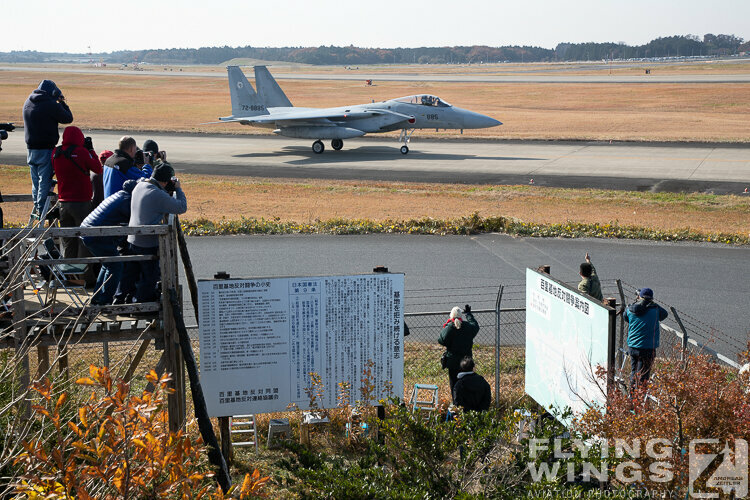 The only exception at Hyakuri was a short interlude by an F-15J Eagle from the Komatsu-based 303 Hikotai. 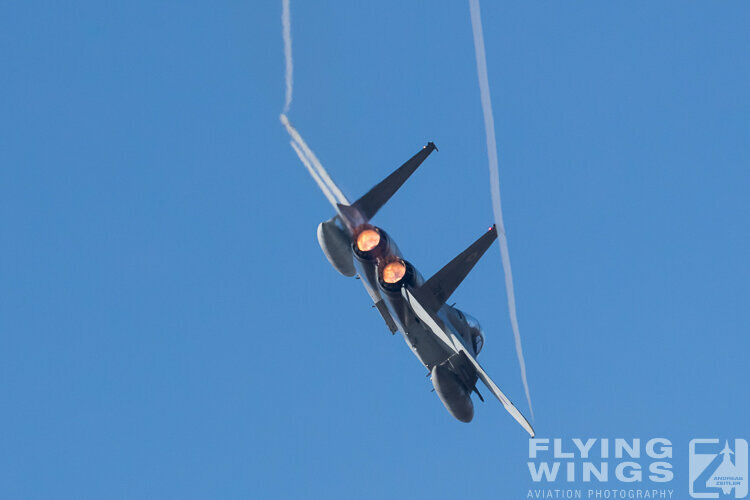 This was also not a full-blown flying display, but more a loose series of fly-bys and tight turns to show the F-15J Eagle in the air. 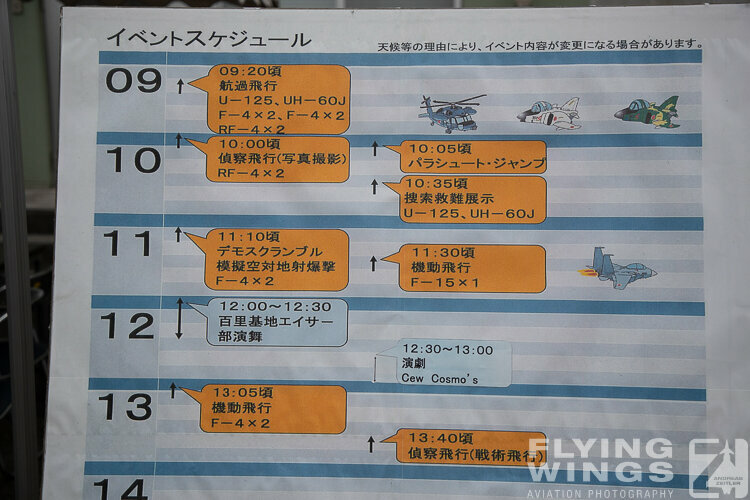 Four main blocks set the frame for the flying display between 9am and 2pm. 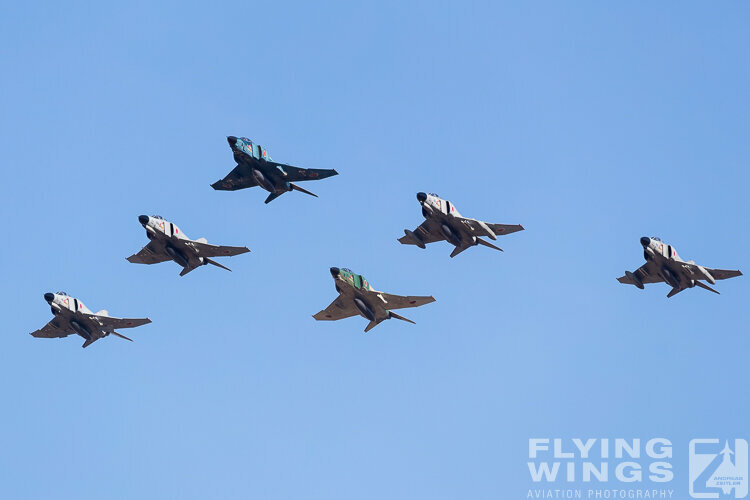 The first presentation of the day was a 6-ship formation of Phantoms! 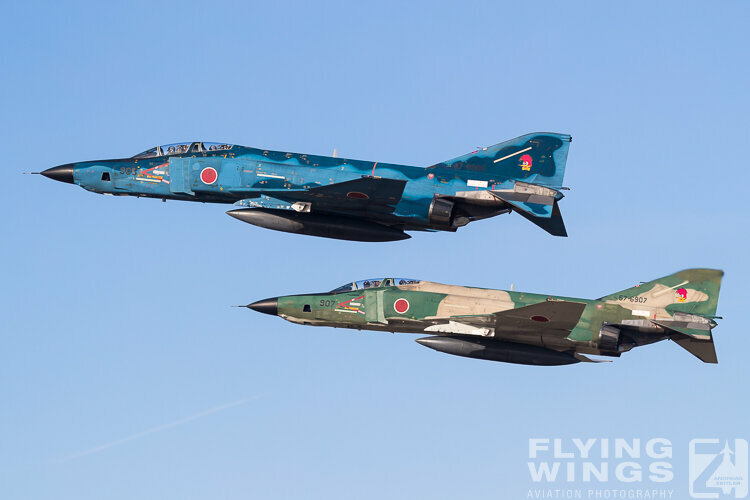 Two jets of each of the three Hyakuri Squadrons participated on this impressive sight. 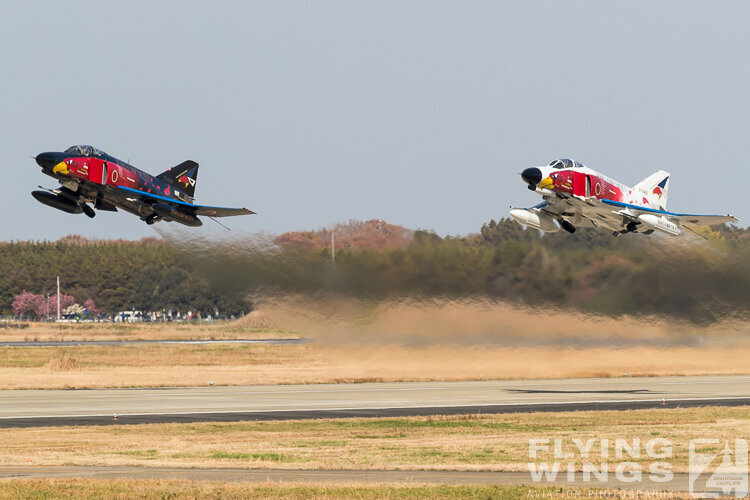 During the rest of the day role demonstrations of the jets prevailed. 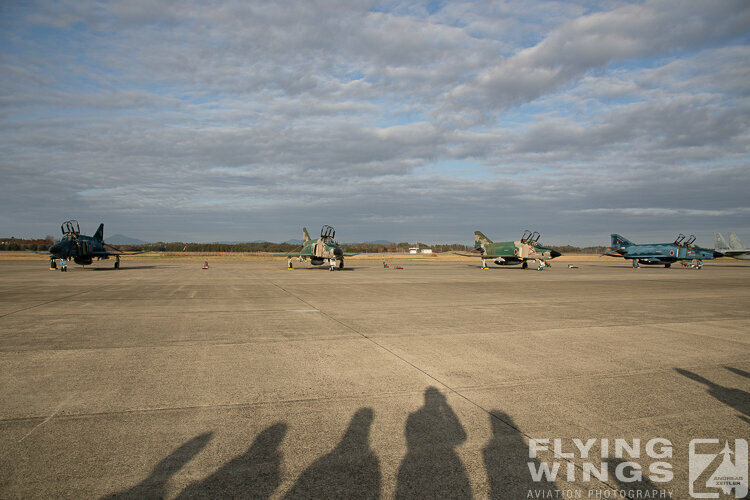 The pilots showed the Phantoms doing Recce runs on the airfield, did some aerial maneuvering, or were flying different ground attack patterns. 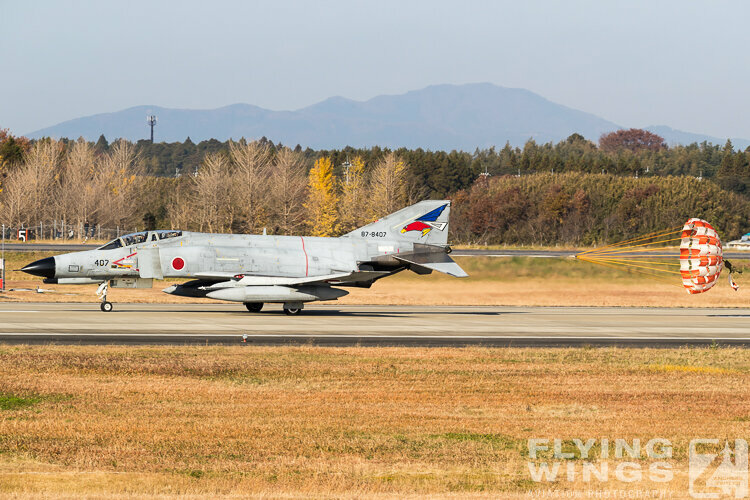 Especially the ground attack was very nice, as it was flown by the two special marked 302 Squadron F-4EJ Phantoms. 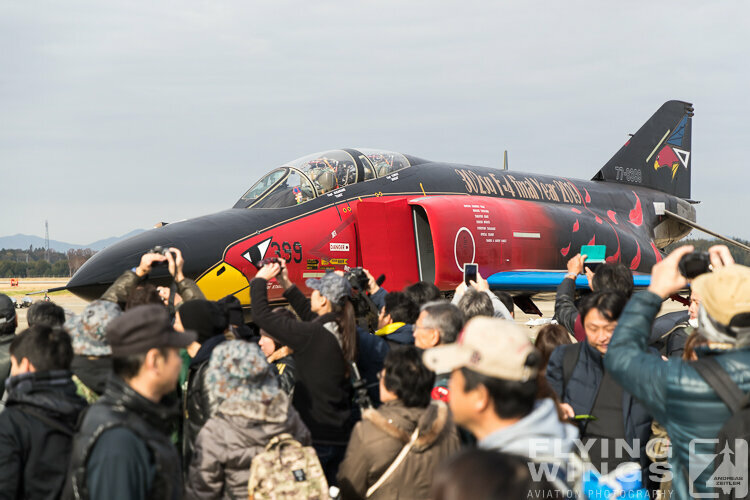 The pull-ups were coordinated in a way as to nicely present the topside of the special to the thousands of spectators on the apron. 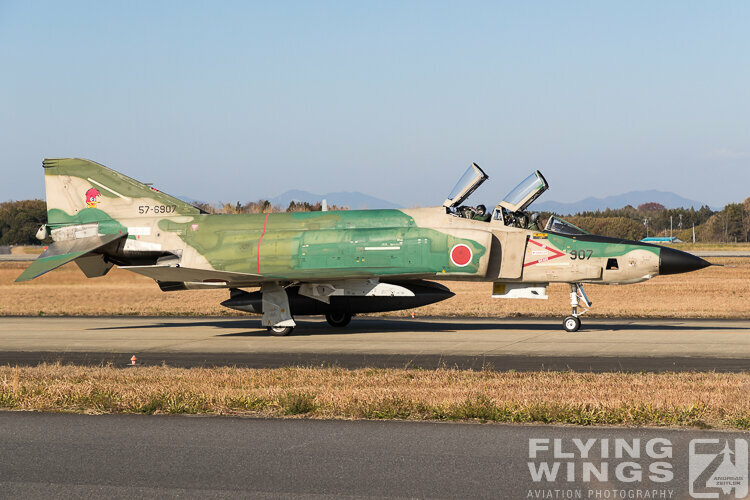 Clearly visible was “1974-2019” on top of the wings, thus marking an amazingly 45 years of Phantom operation. 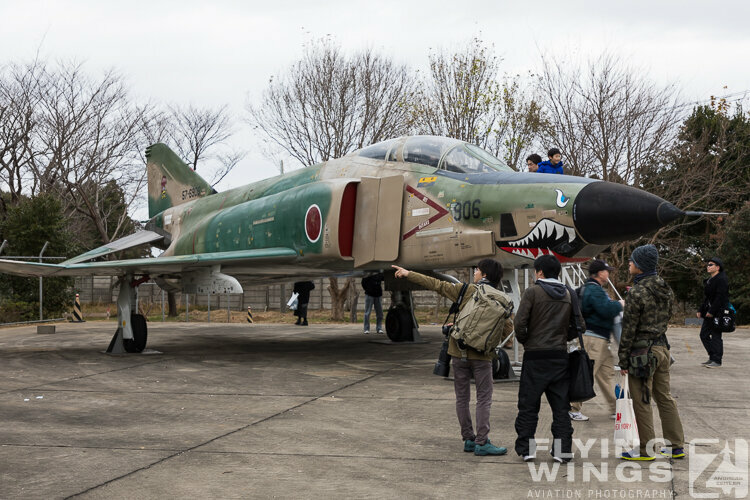 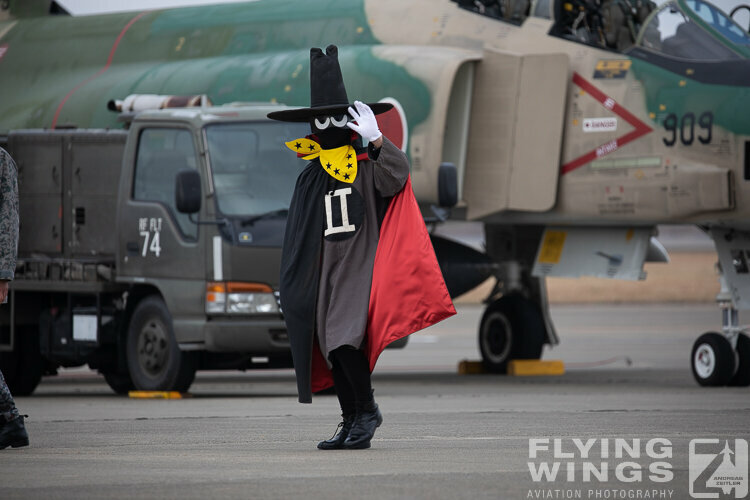 Furthermore the 302Sq Phantom II emblem and a large Spooky – the F-4 Phantom II mascot – were not to be missed. 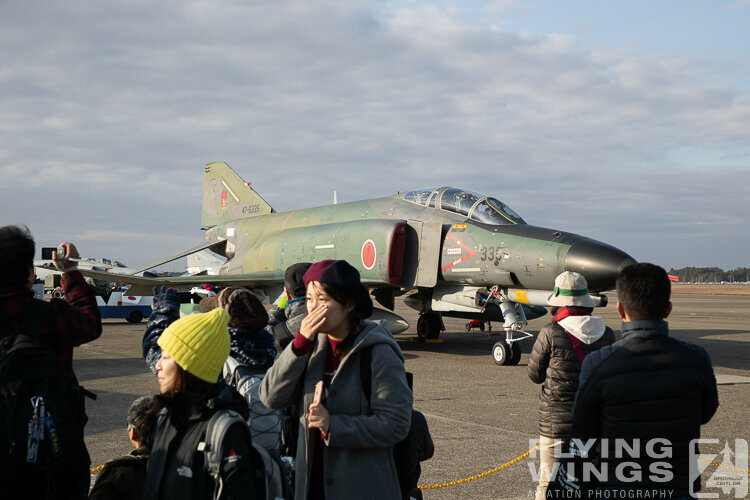 The Hyakuri Airshow was a great and last chance to witness the mighty Phantom in such large numbers for a final time. 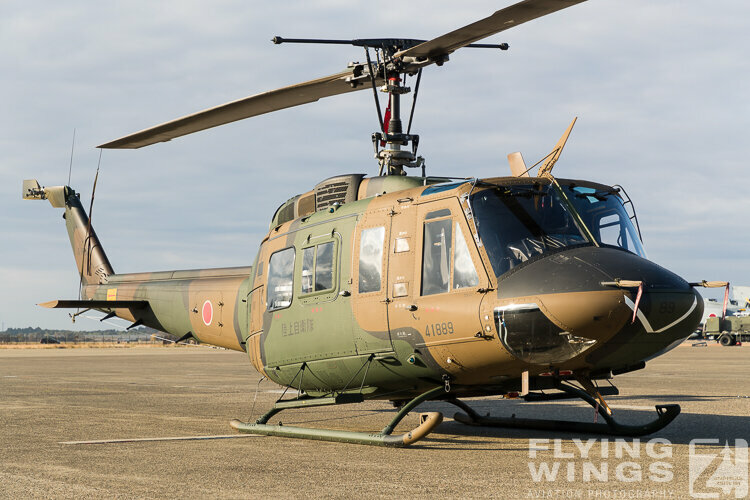 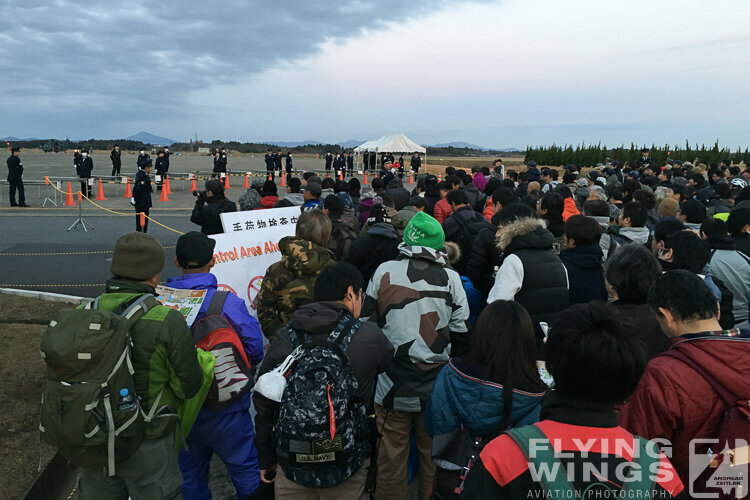 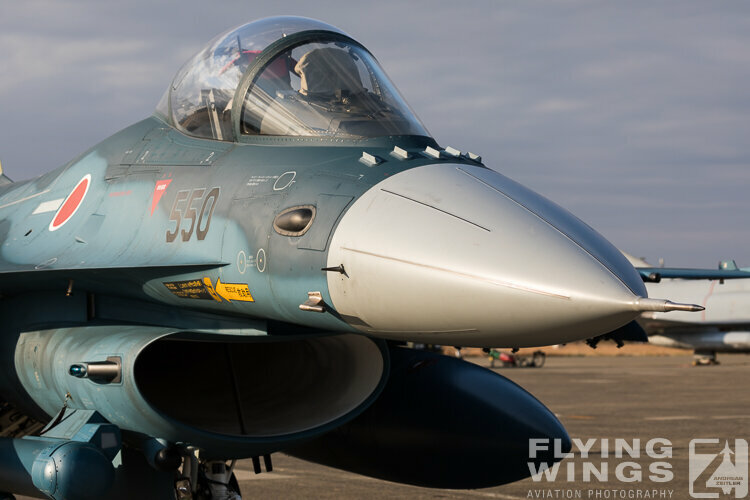 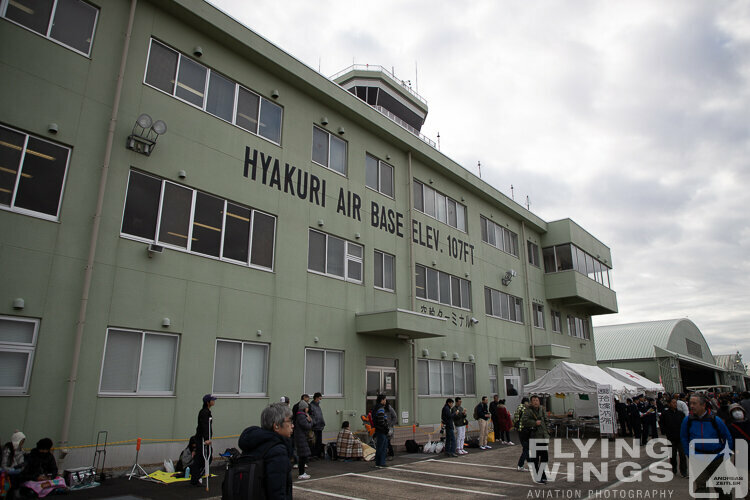 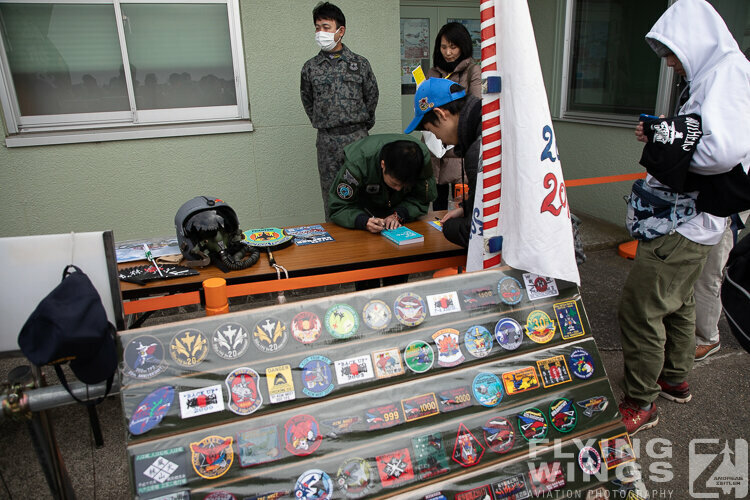 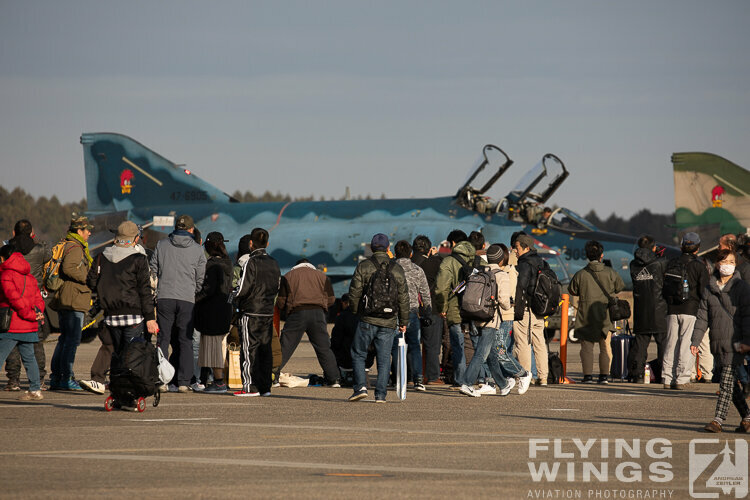 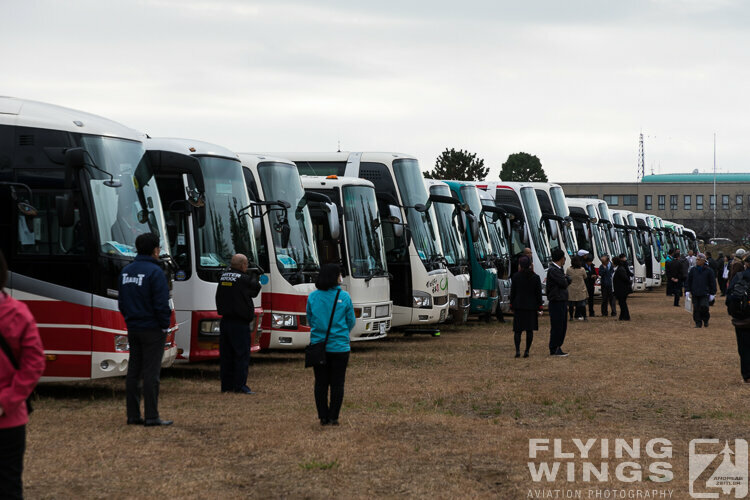 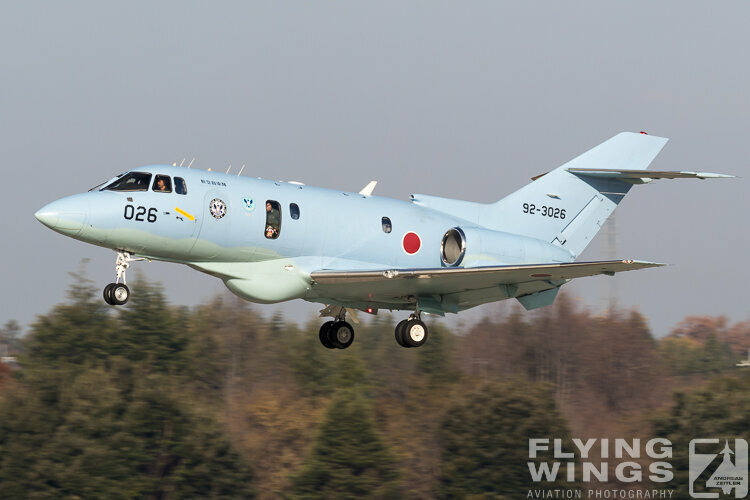 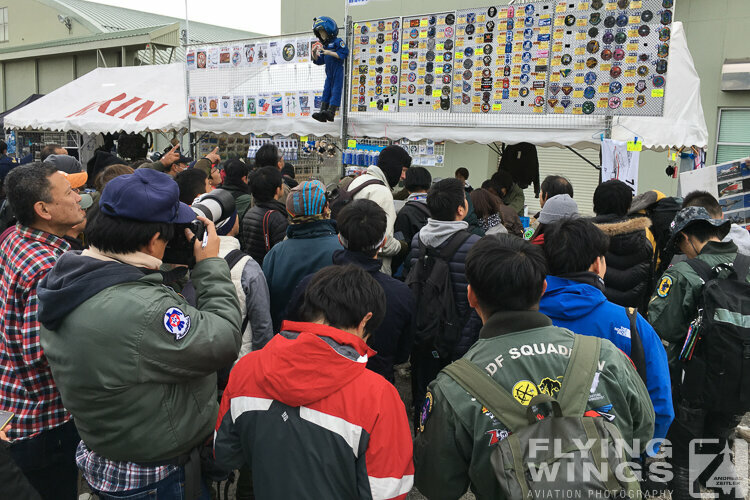 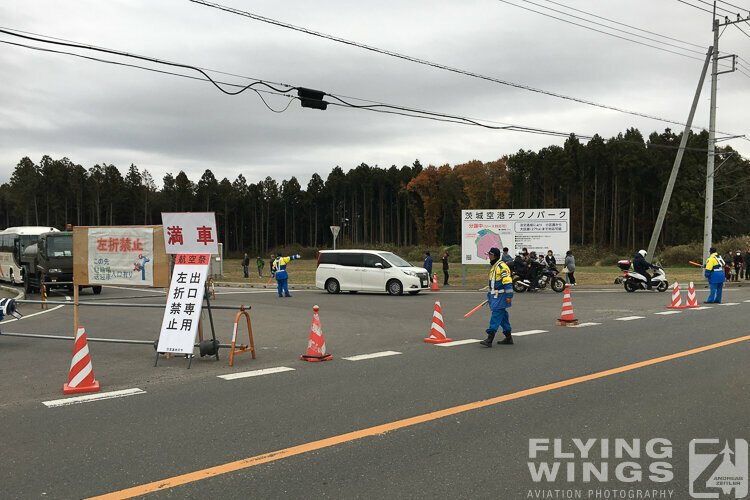 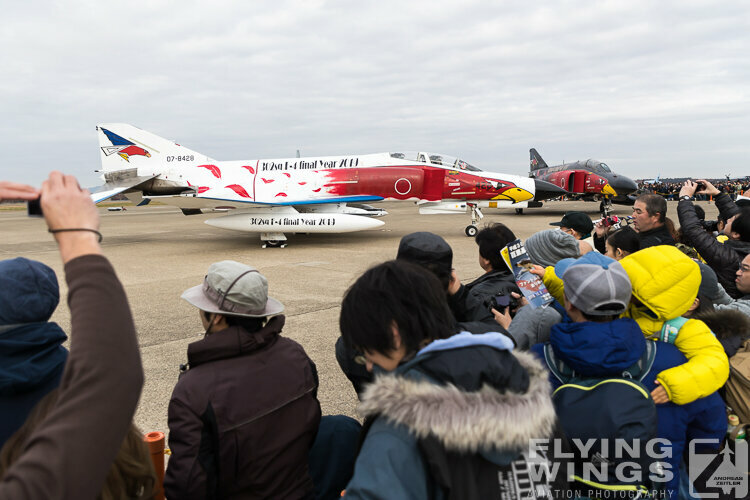 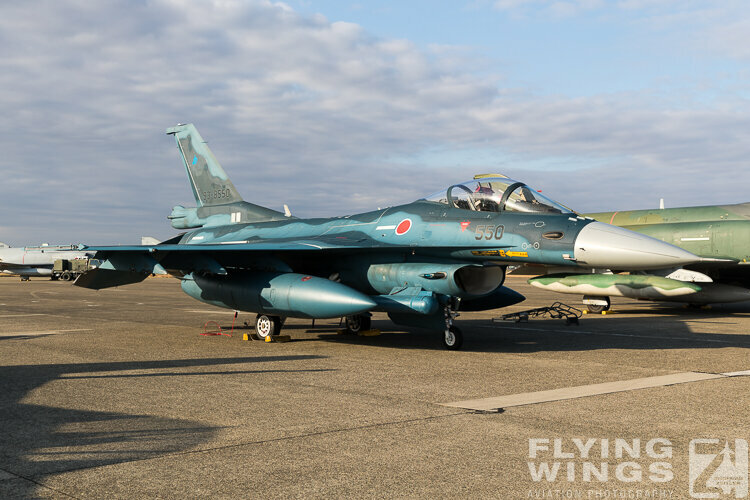 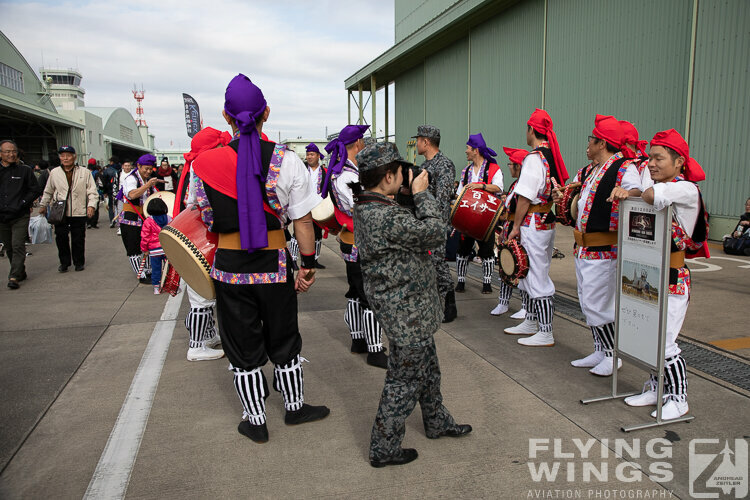 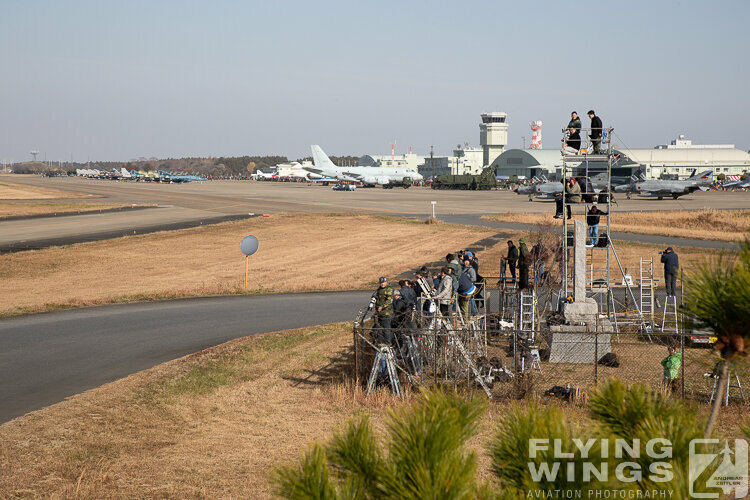 Obviously also quite a large number of foreign enthusiasts took the chance to witness that event at an airbase which is conveniently located close to Japan’s capital Tokyo. 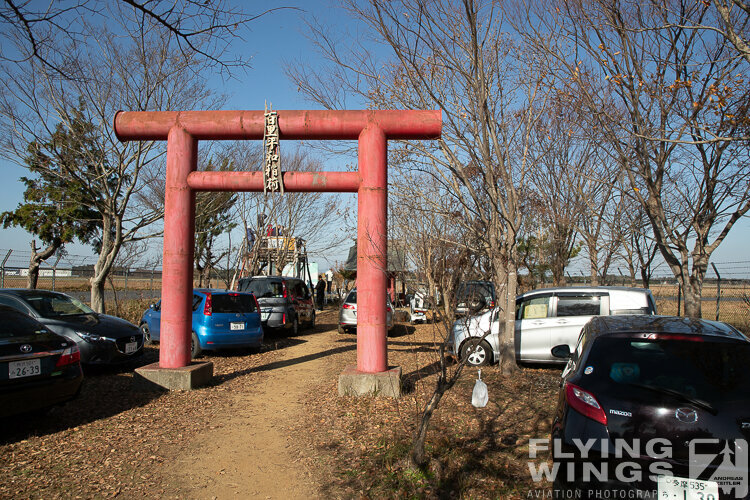 It is approximately one hour North of Narita airport and therefore quite easy to reach. 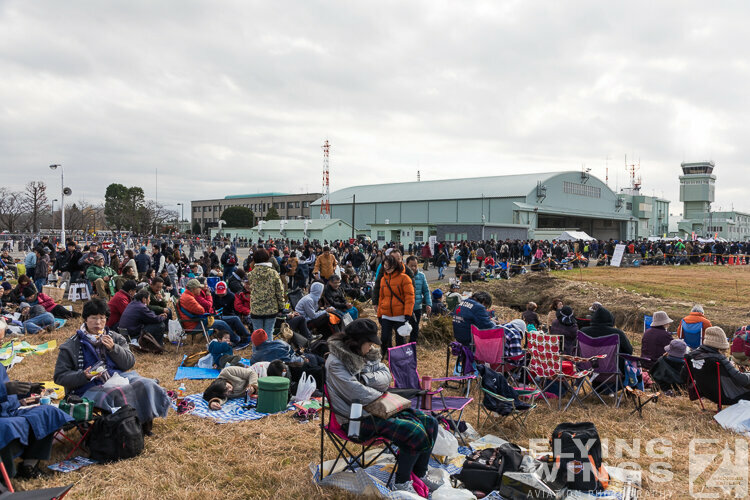 However, those foreigners did not really stand out against the thousands of Japanese photographers who also made this show at Hyakuri a truly Phantom pilgrimage. 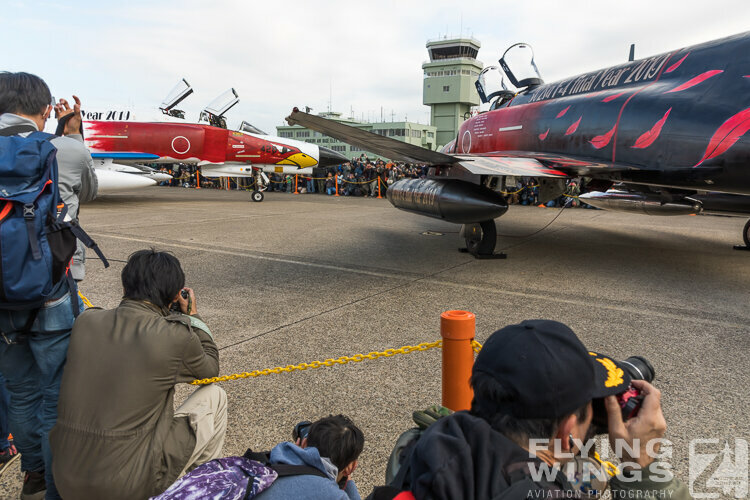 Apart from a great flying display the only other main ingredient for a great airshow however did not really cooperate. 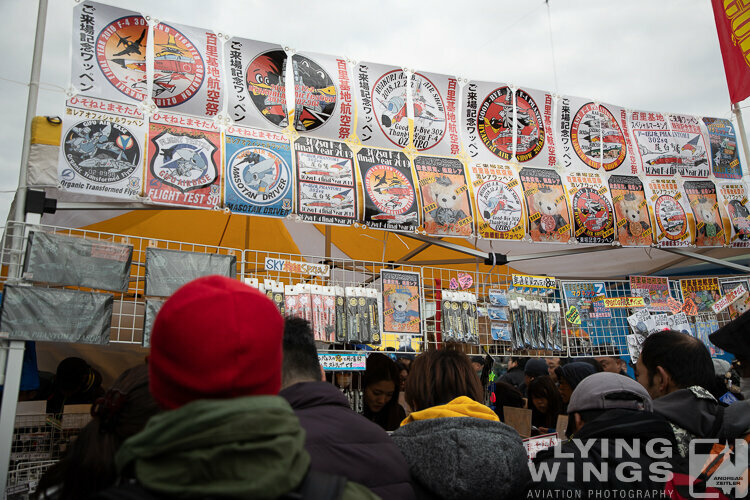 Apart from a few sunny spells in the early morning most of the remaining day was covered in clouds and without the sun it was also rather cold. 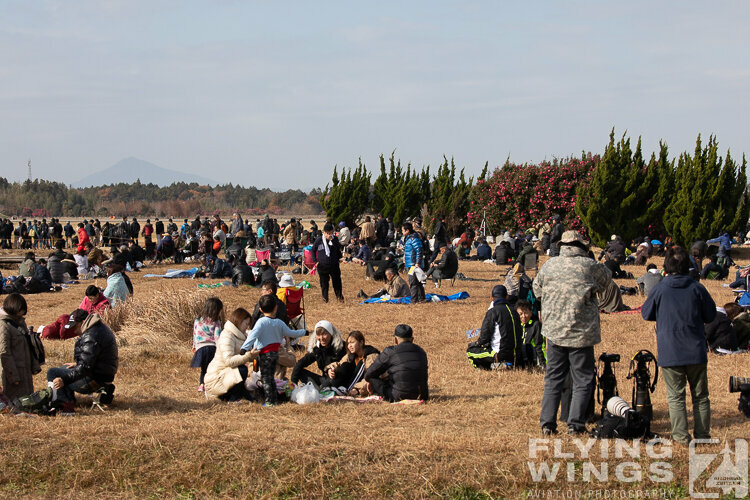 Admittedly it was December, but how great it can be in December was obvious just the day before. 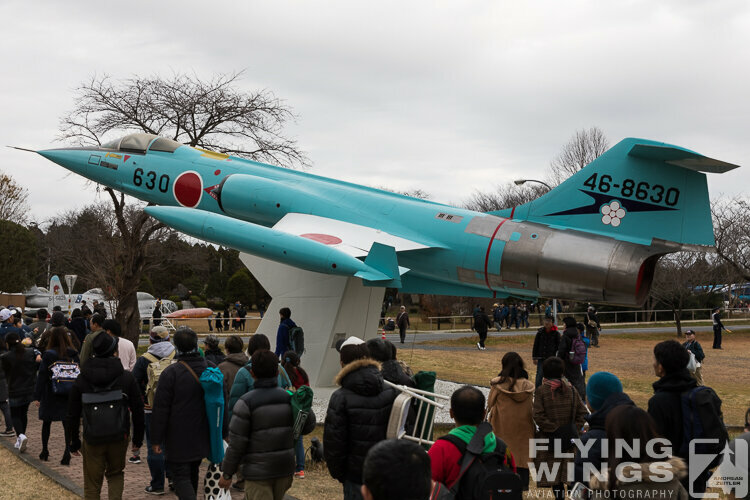 For the family day on Saturday a clear and deep blue sky prevailed. 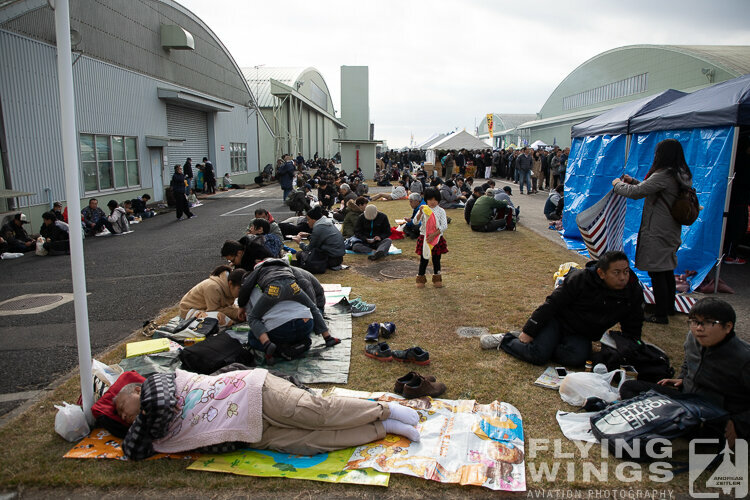 Luckily for those that already took the chance to visit the airbase on that day. 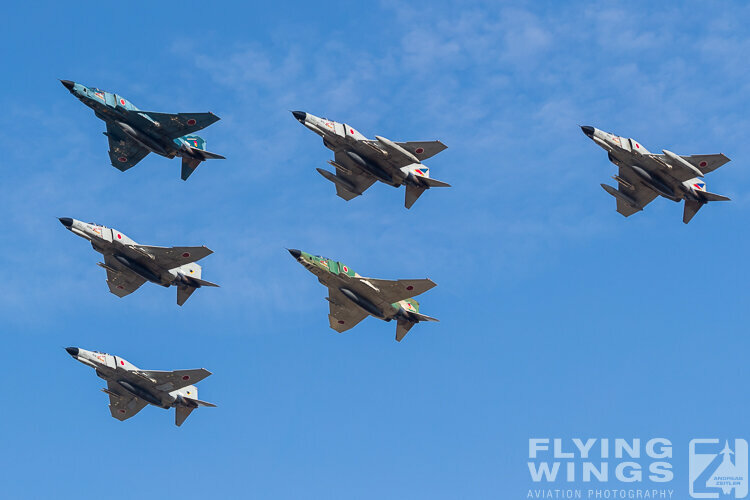 Even if it was only from the outside, the formation take-off of the two special schemes and photographing them from the famous ‘the Towers’ location was the shot of the day.